Often, before embarking on a trip, there are certain things – sights, activities, places – upon which one sets ones heart to see, do or visit. 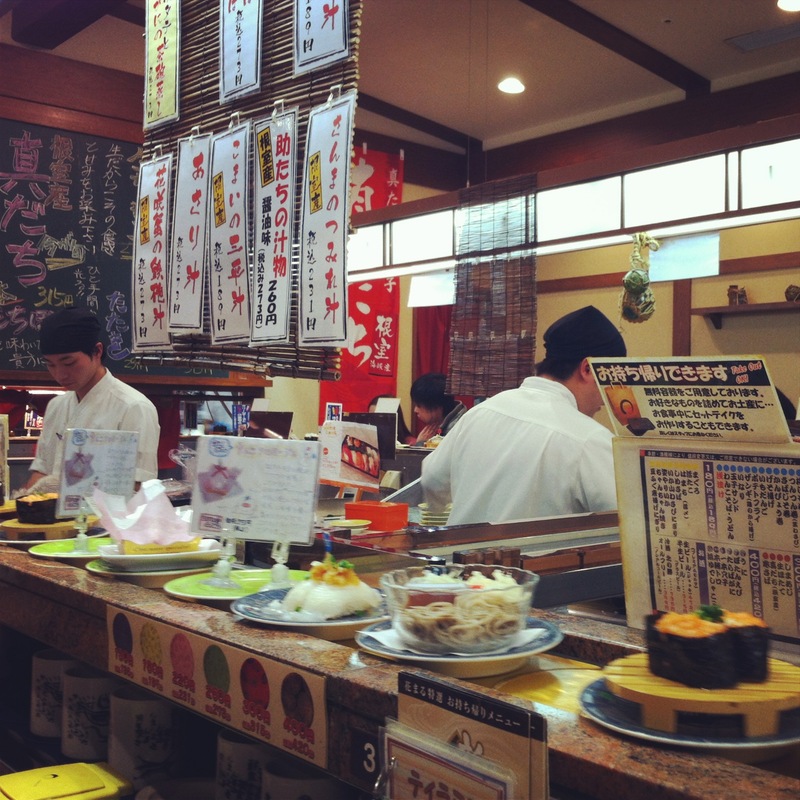 Before I came to Japan, for example, my list included things as obvious as eating real sushi and seeing the bright lights of Tokyo, along with those things I never thought I would actually have the chance to do, such as skiing, and visiting Hokkaido. As my final months abroad are approaching, I am becoming ever more determined to make sure this list is not left unfinished, especially as I am unsure when I will next be able to return to Asia, let alone Japan. Third year is looming, and who knows where life will take me post-graduation, so as the weeks go by, my resolve to make the very most of them grows ever stronger. Earlier this week, this resolve took me to another place which I had wanted to see since I arrived in September. We’ve had ten days vacation for Golden Week, one of Japan’s busiest holiday periods containing a variety of national holidays, including Showa Day, the former Emperor Showa’s birthday, and Greenery Day, a day dedicated to nature and the environment, and Aliya and I took the opportunity to squeeze in a short trip to Hiroshima and Miyajima. 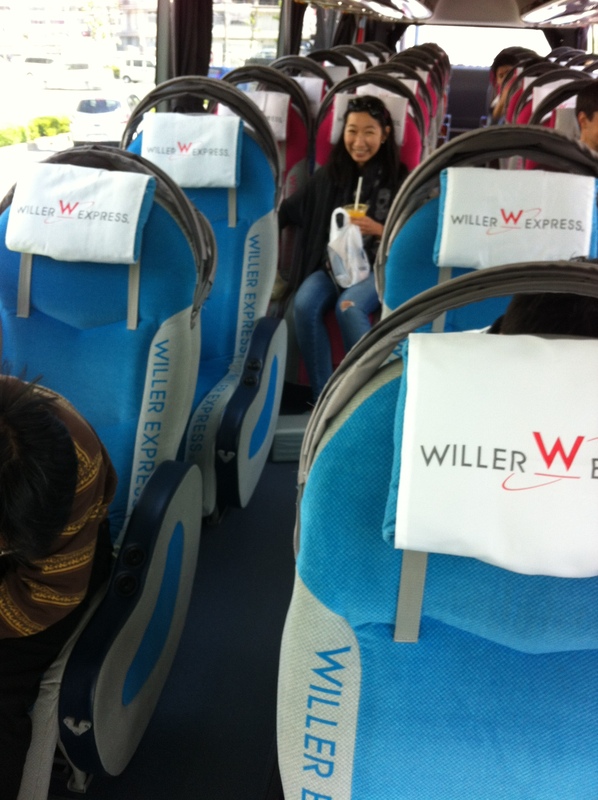 Being poor students, we opted for the bus rather than the Shinkansen (bullet train), which is half the price albeit three times as long. Getting up at 4:45am is never fun, however buses in Japan are unlike any other bus or coach I have ever seen – seriously comfortable seats which almost fully recline, individual hoods to block out the light and a decent amount of leg room, especially if you’re towards the front, so you are actually able to get a decent sleep. Having travelled on the worst of the worst – a night bus in Laos without a seat – I couldn’t have appreciated this more. I managed to get a few hours on the way up to Hiroshima, and we arrived absolutely famished and more than ready for lunch. Terrible picture, but I’d just like to draw your attention to the unbelievable amount of leg room!! 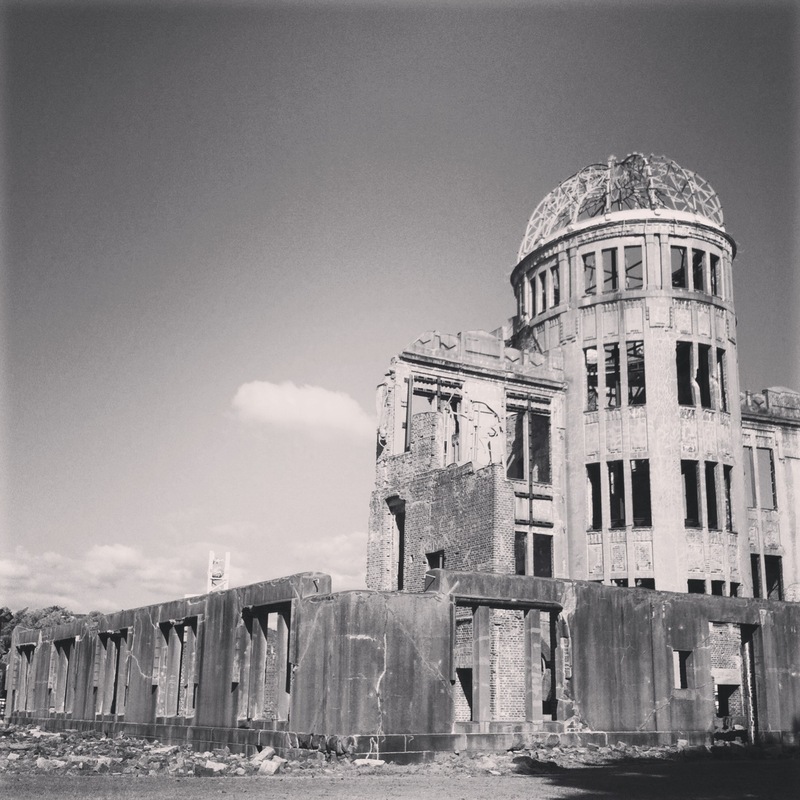 Hiroshima was, as everyone is aware, put on the map in the most terrible of ways: the first atomic bomb was dropped on the city by the US at the end of the Second World War. 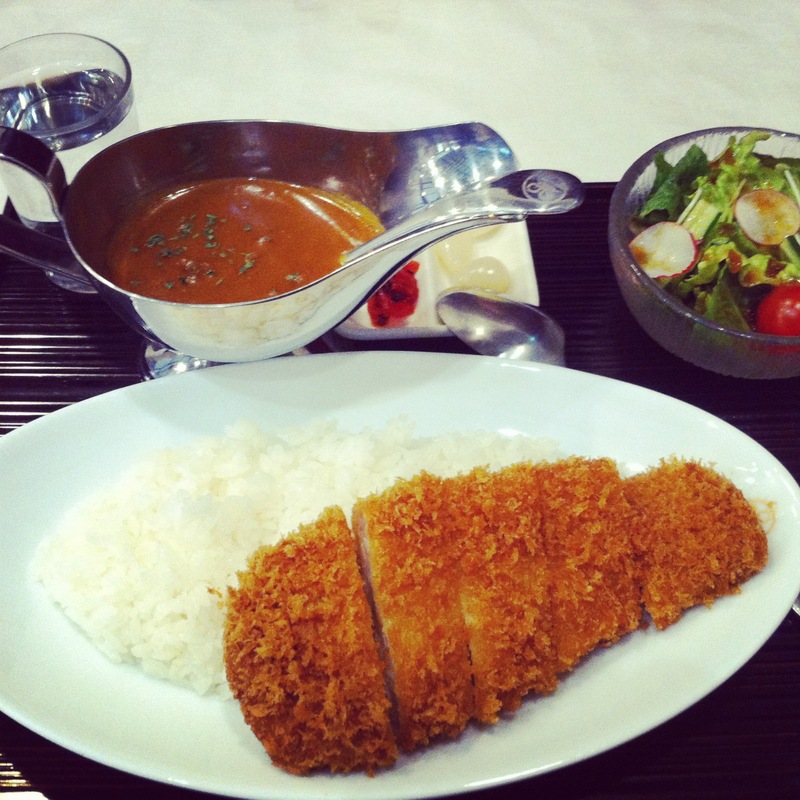 It is, however, also renowned for much more positive reasons, such as a personal favourite of mine – food. 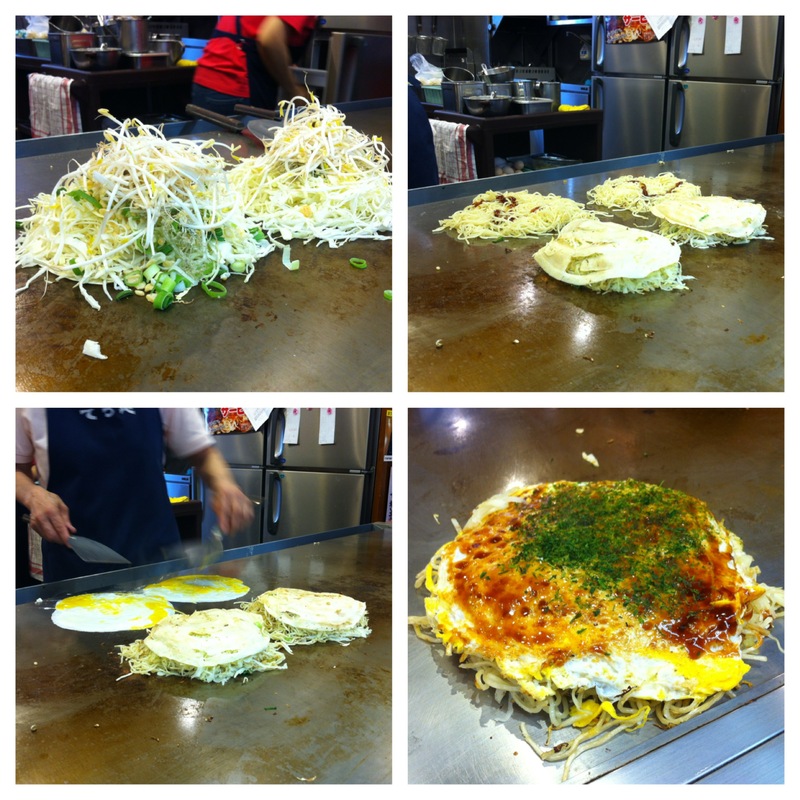 The most famous dish is okonomiyaki, a kind of vegetable pancake. I’ve eaten okonomiyaki many times before, in both Osaka and Kyoto, and it’s probably one of my favourite Japanese dishes, but Hiroshima-ites have their own unique style, adding soba noodles, and often toppings such as oysters and squid. We ate at an establishment called Okonomimura, which is basically three floors of tiny okonomiyaki restaurants, and the food was unbelievable! Huge portions, and the addition of noodles is completely inspired. 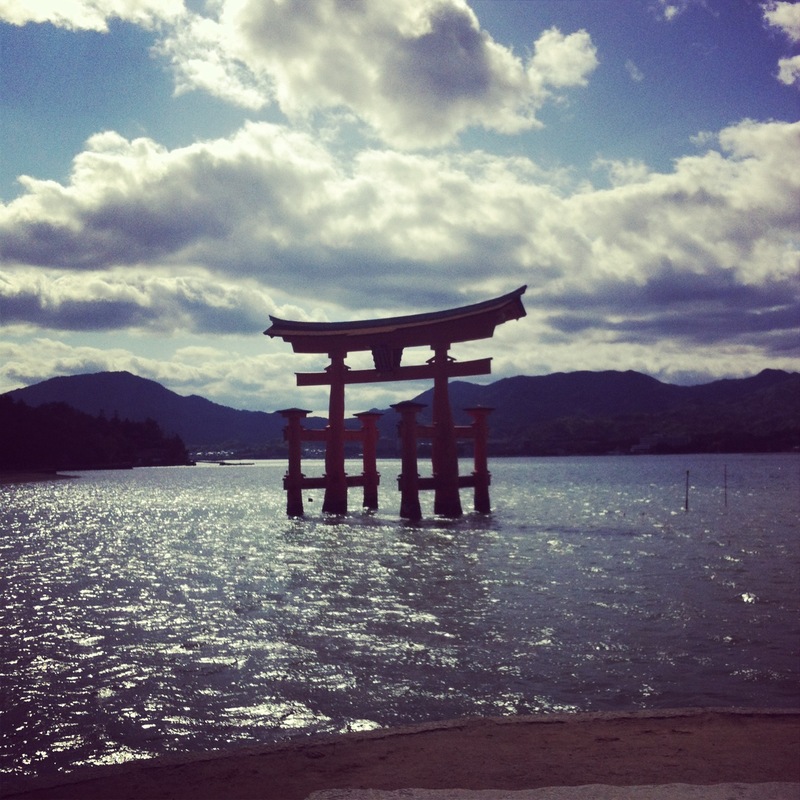 After lunch, we headed over to Miyajima to see the great floating Torii of Itsukushima Shrine. 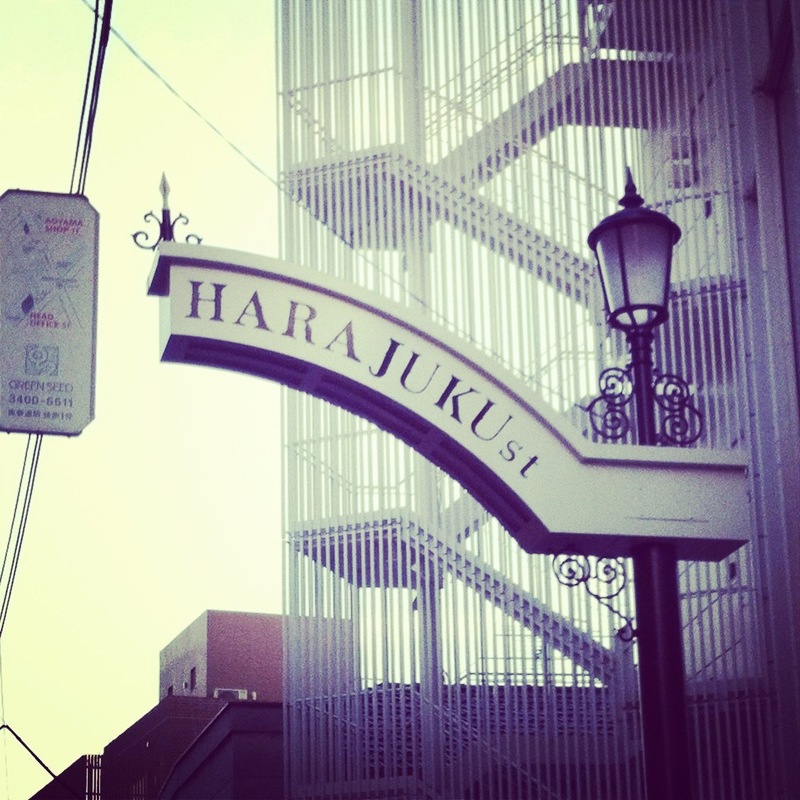 I am so pleased to have had the opportunity to visit this place, which was fairly high up on my Japan bucket list. As we arrived later in the day, the crowds of tourists were beginning to dissipate. As in Nara, the island of Miyajima is inhabited by a number of rather tame deer, although they definitely seemed less aggressive than Nara’s furry residents – most of them were just snoozing in the sun. 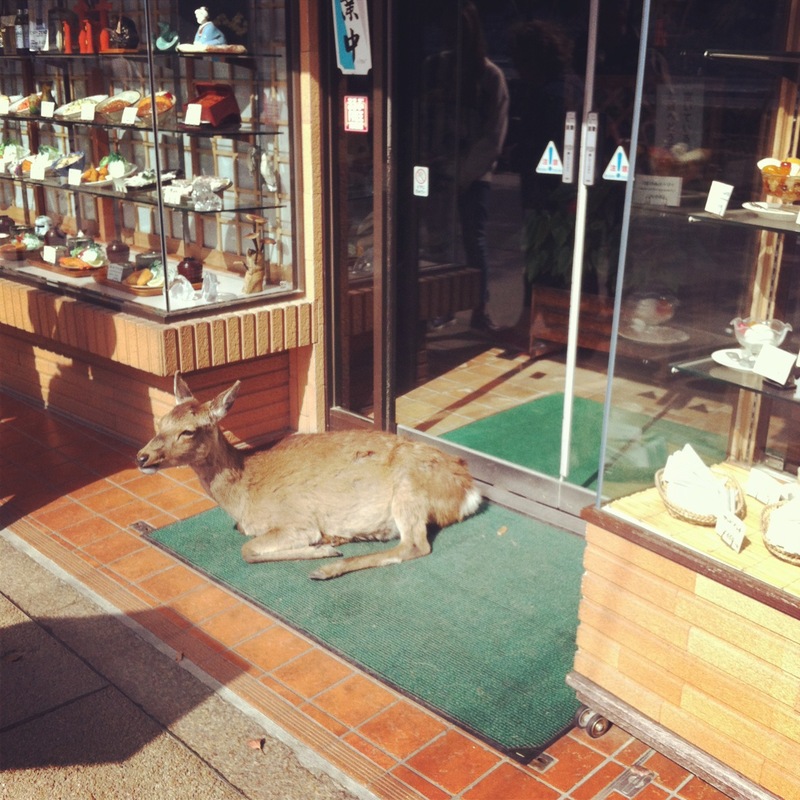 Very casually sunbathing outside a restaurant.. 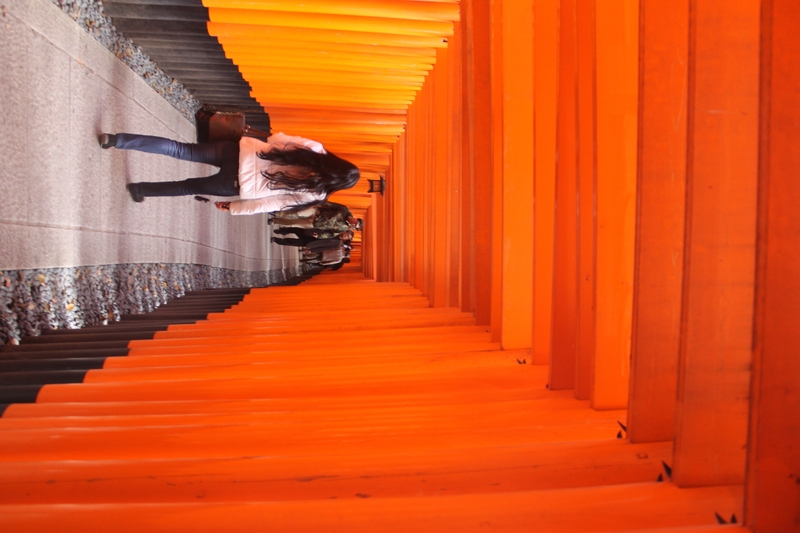 The Torii itself was amazing – it was easy to see how it’s become one of the iconic Japanese sights. We overheard a tour guide telling her group that the structure actually has no foundations – it’s weight alone holds it in place, which is pretty incredible. After the Shrine, we sampled some more of the local cuisine at one of the oyster bars on Miyajima’s main shopping street, Kaki-ya (which, quite literally, means oyster shop). I never thought I would ever be able to get excited about oysters until I tried one for the first time in Sapporo, and found it to be a rather enjoyable experience. 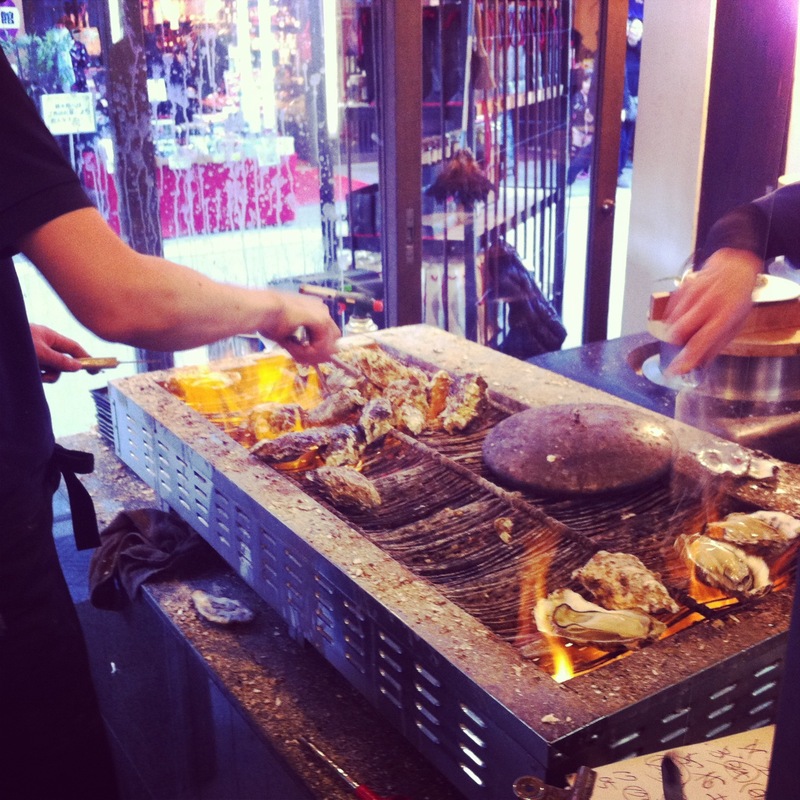 Whilst I’m still not brave enough to try a raw one, the oysters at Kaki-ya are grilled on a barbecue at the front of the bar, and they were truly divine. 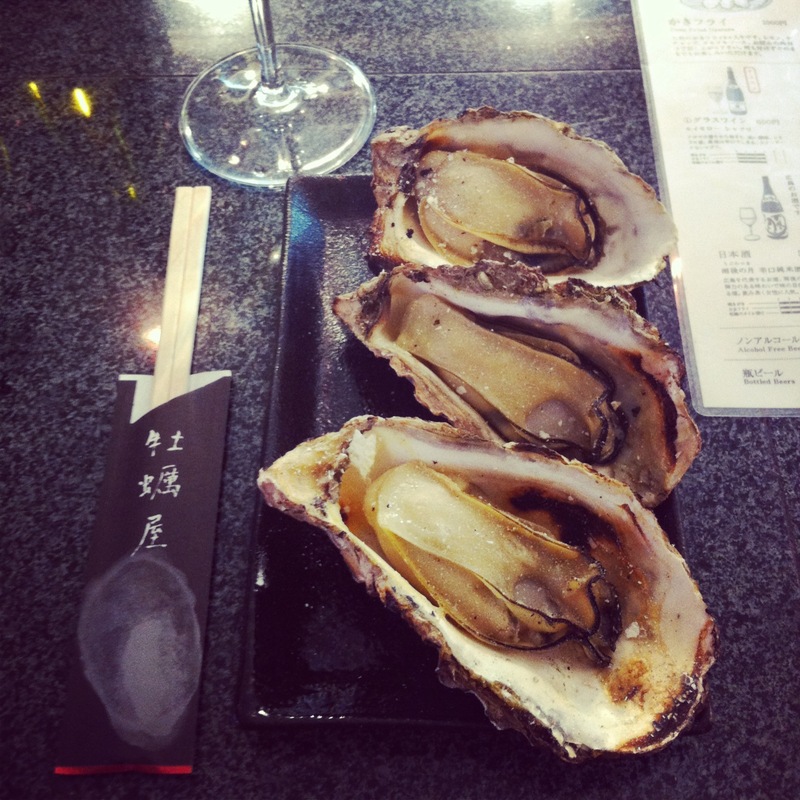 Hiroshima Prefecture produces between 60 and 70% of Japan’s oysters – around 30,000 tonnes per year – so it would have been terribly rude of us not to try at least one. Inevitably, they were so delicious that we ended up having far more than one – we began with the oysters and rice set, and ordered a second plate of grilled oysters each, all washed down with a glass or two of Chablis. It was all very pretentious – the bar itself had a very upmarket feel – but the prices were so reasonable. Rest assured you’d pay about three times more if it had been in London! They might not be the most attractive food to look at, but don’t judge a book by it’s cover. 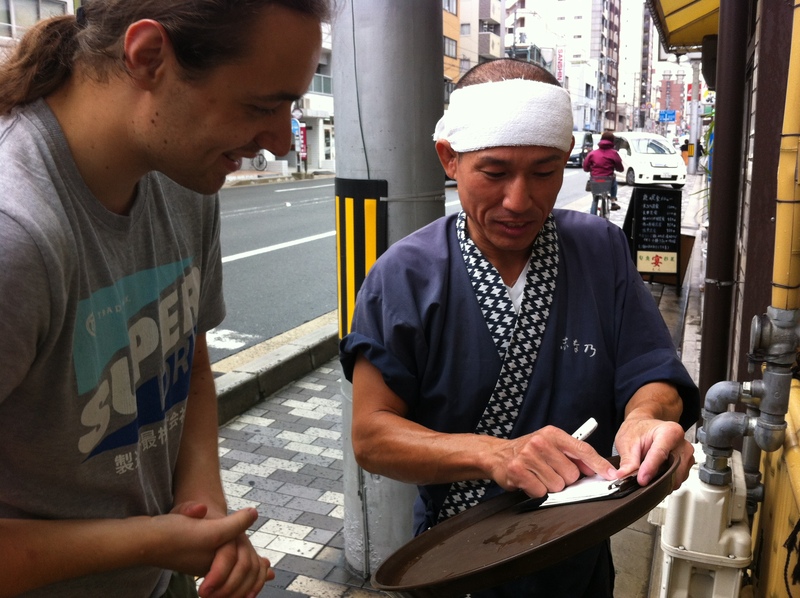 This was one of my top ten meals, not just in Asia, but in my life! The following day we woke up early and headed straight to the Peace Memorial Park. You can’t possibly visit Hiroshima with out paying a visit to the park and museum, which are truly moving tributes to all the lives lost in the bombing. It was a sobering morning, as we’d expected, and left both Aliya and I in a very thoughtful and reflective mood for the rest of the day. The recovery of the city is a true testament to the strength and resolve of the Japanese as a nation, and I believe the international community has a lot to learn from Japan in terms of cooperation – the lack of bitterness towards the United States after what was, without a doubt, one of the most atrocious acts in history, is something which really struck me during our short trip. Finally, we went to the National Peace Memorial Hall, specially built to commemorate the lives of those lost in the bombing. 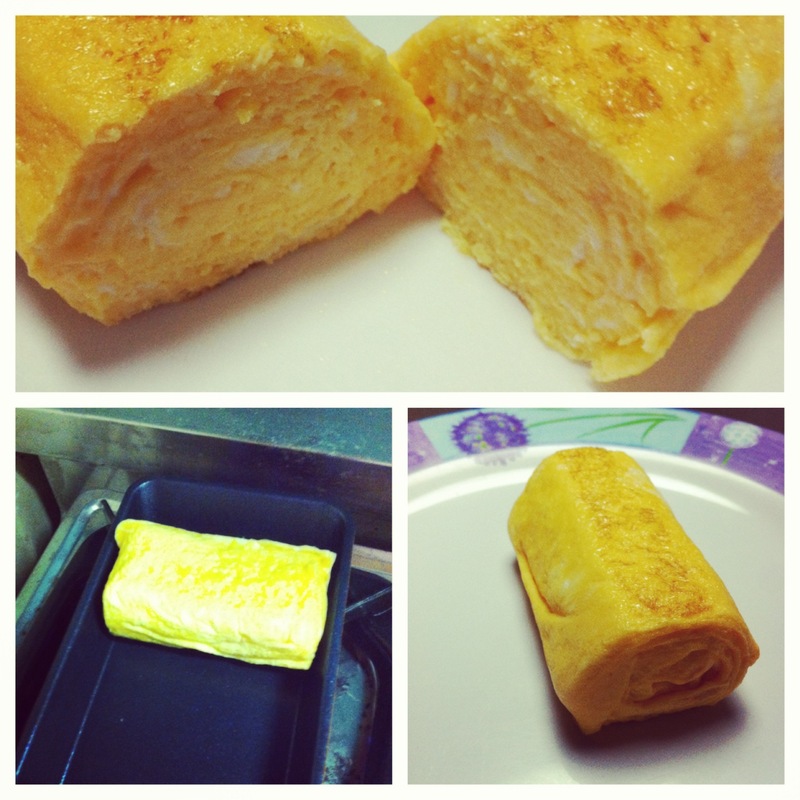 Aliya and I agreed that only the Japanese could create something so simple, but at the same time so full of meaning. Each tile represents a lost soul, a total of 140,000, and the fountain is a tribute to all those who died desperate for water in the aftermath. 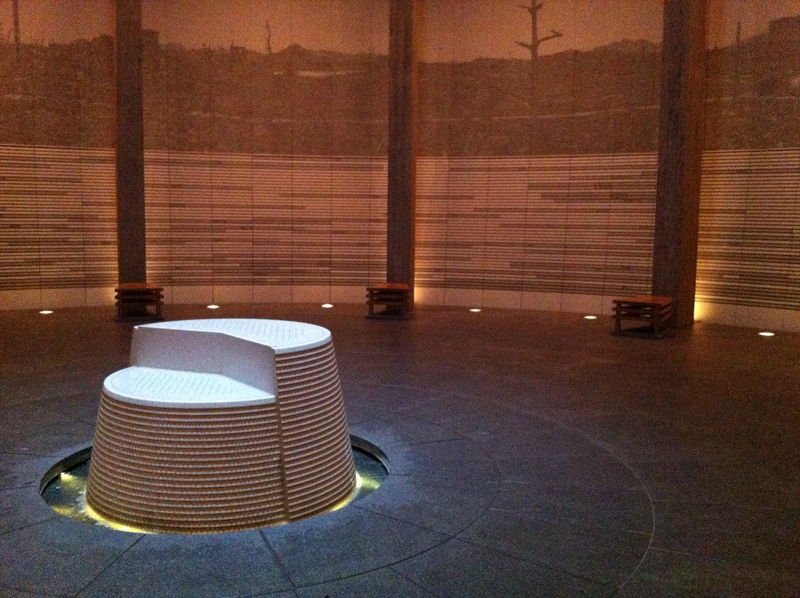 The Hall is such a beautiful space, and truly conveys a message of peace. Unfortunately, our time in Hiroshima had come to and end, and we made our way back to the train station to catch our long bus home. Although we only had 24 hours in the city, it was definitely worth it, and not just because I could tick another thing off my list. 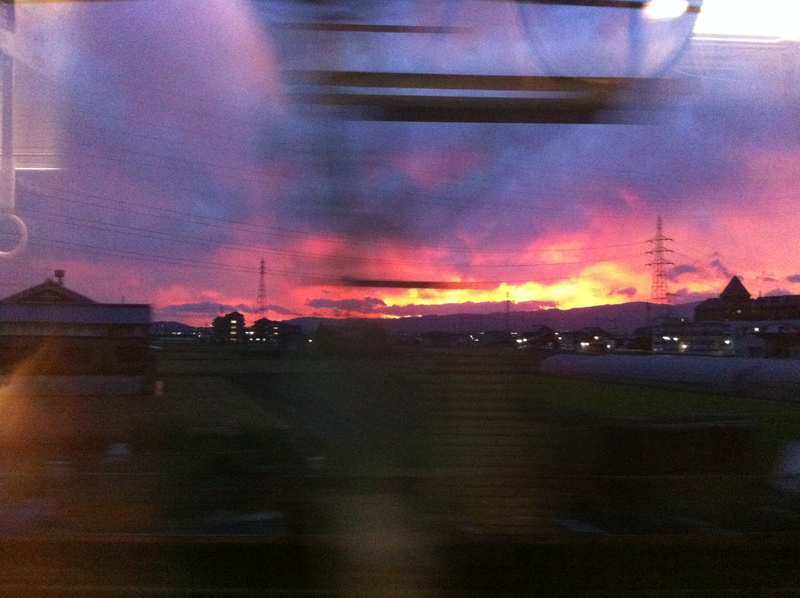 I’ve been back in Japan for around two weeks now, and already home feels like a million miles away. Spring is officially upon us: the weather is getting warmer (I spent two days sunbathing by the river last week, and Aliya told me the other day I looked tanned! 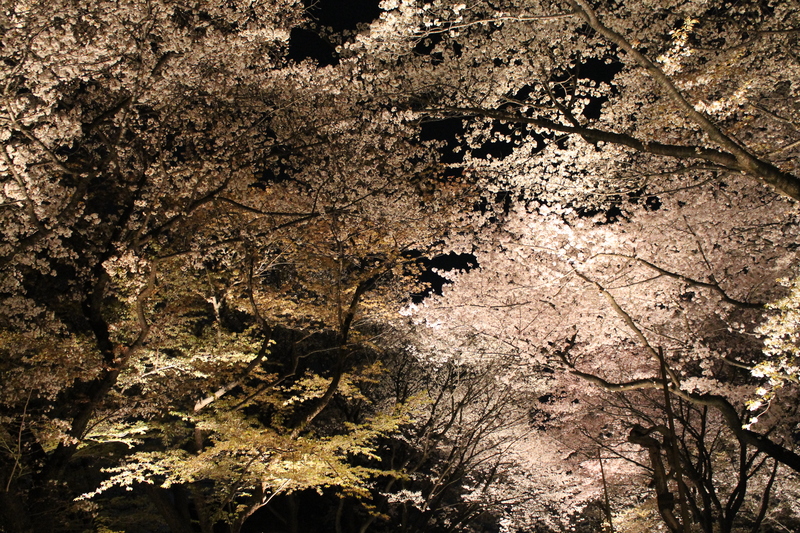 ), and the sakura (cherry blossoms) have been in full bloom. Unfortunately for me, a chronic hayfever sufferer, this has meant two weeks of hell, as I stupidly forgot to bring any medication back with me. Thankfully, it’s now arrived via the post – what would we do without Mums eh? 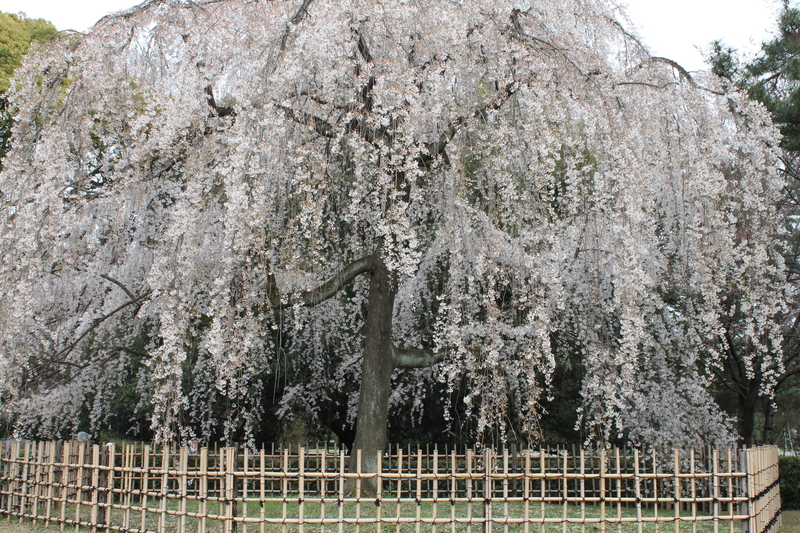 The blossoms are incredible – I can completely understand why they’re so renowned. They quite transform the city. 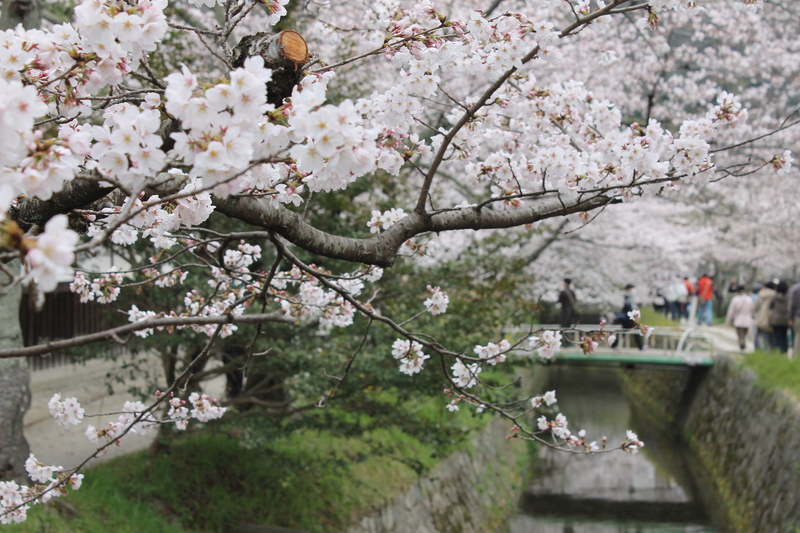 I spent the final weeks of the vacation braving my allergies for hanami, or flower viewing, along with everybody else in Kyoto it seemed. One of the things I love most is to see everyone out with their cameras, spending time outside with their friends and family. There’s such a fantastic atmosphere at the moment, now the the cold of winter is finally disappearing. 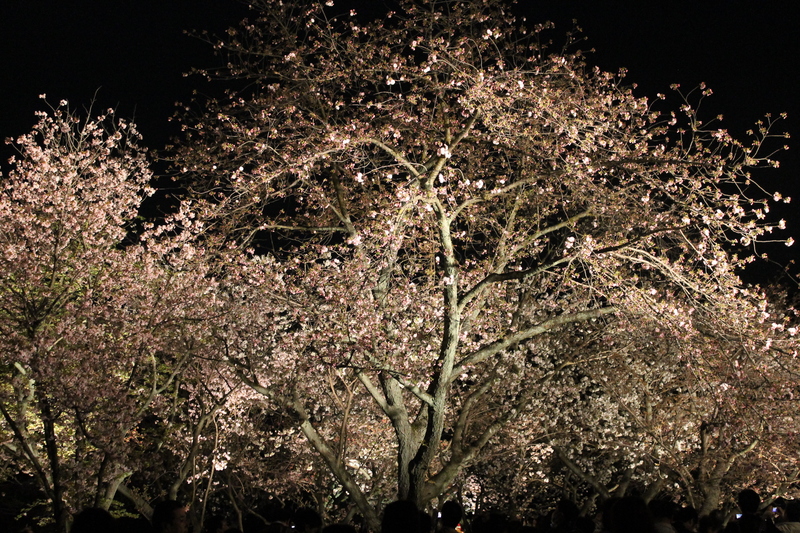 Aliya and I visited some of the classic hanami spots, such as the Path of Philosophy and the Nijo Castle Lightup, which was spectacular. We each took about 500 photos I think, but I’ve chosen a selection of the best for you. The spring semester at Doshisha has begun this week – I had my first class yesterday, so I guess the break is over again for now! 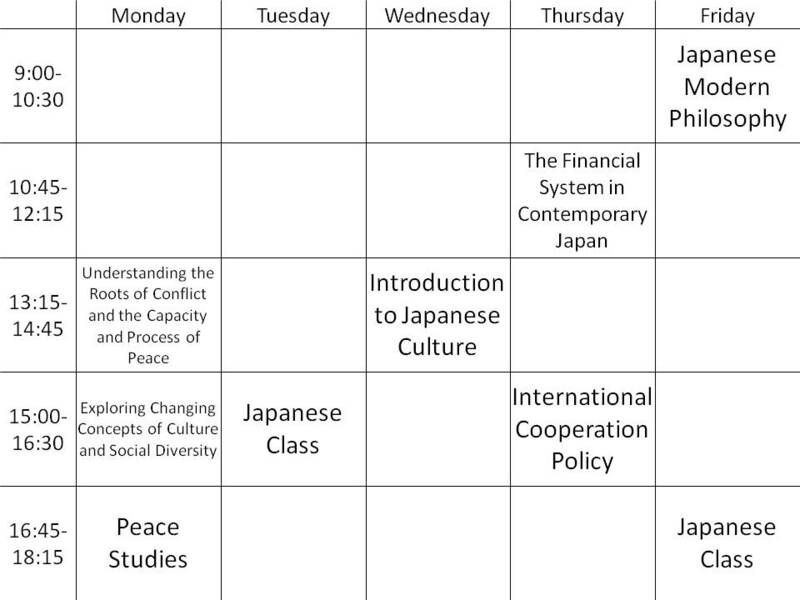 I’ve taken less classes this term – two Japanese classes, in an effort to try and make some progress before I depart, one from the Global Communications faculty (Cultural Interaction), and two from the Institute of the Liberal Arts (Buddhism and Zen in Japan, and Introduction to Kyoto Studies). I decided to stay away from the more politically oriented classes this semester, and take those which I would never be able to take at home. Hopefully they’ll be interesting! I’ll keep you posted. Both Aliya and I will be leaving Japan at the end of the semester, so we’ve made a list of all the things we want to do before we go, including a visit to Hiroshima, lots of hiking in the hills around Kyoto and potentially another trip to Tokyo (fingers crossed!) 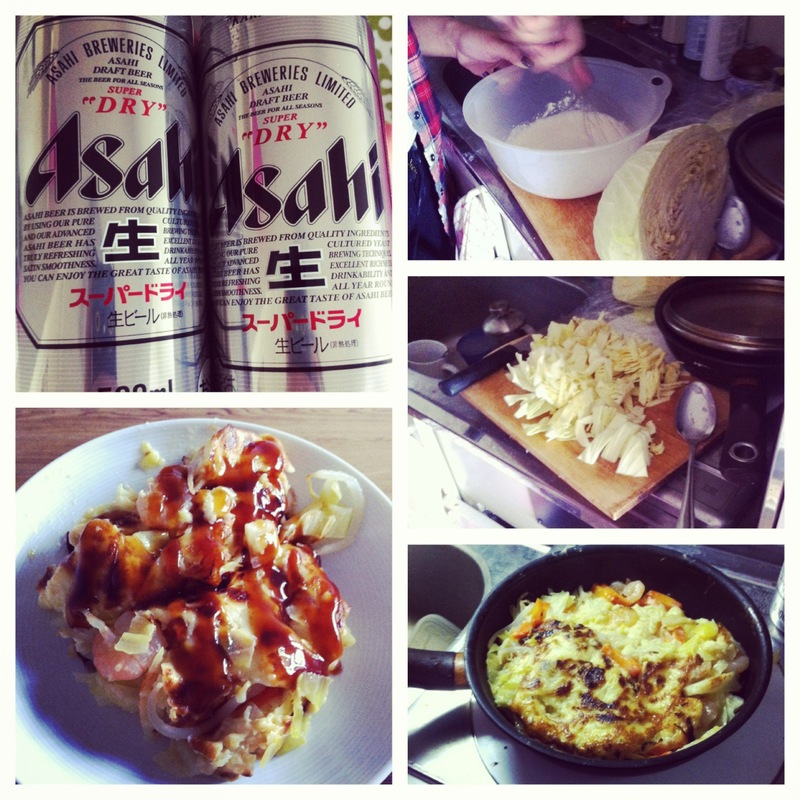 We’re also trying to perfect our Japanese recipes – she’s great at making Okonomiyaki, which we had on Easter Sunday, and I’m getting pretty good at making egg rolls – here’s some visual evidence! We want to try and make our own sushi next, although I’m not sure how smoothly that’s going to go – probably best left to the professionals! Well, I’ve just arrived back in the UK after a hectic couple of weeks travelling and sightseeing with my friend from home, Charlene, who came out to visit me. I know last time I promised not to leave it so long before the next blog but, as usual, time slipped away and let’s just say I’ve been making the most of the holiday! Term finished at the end of January and, as I mentioned before, Aliya, Kanat and I took a trip up to Sapporo for a few days. It was absolutely freezing, the coldest temperatures I’ve ever experienced, much to the other guys’ amusement (Aliya told me it can get as low as -50 in Kazakhstan! ), and I’ve never seen so much snow, but it was a fabulous trip. We skied for a day – probably the world’s shortest ski trip, but I couldn’t come all the way to Japan and not ski at least once! 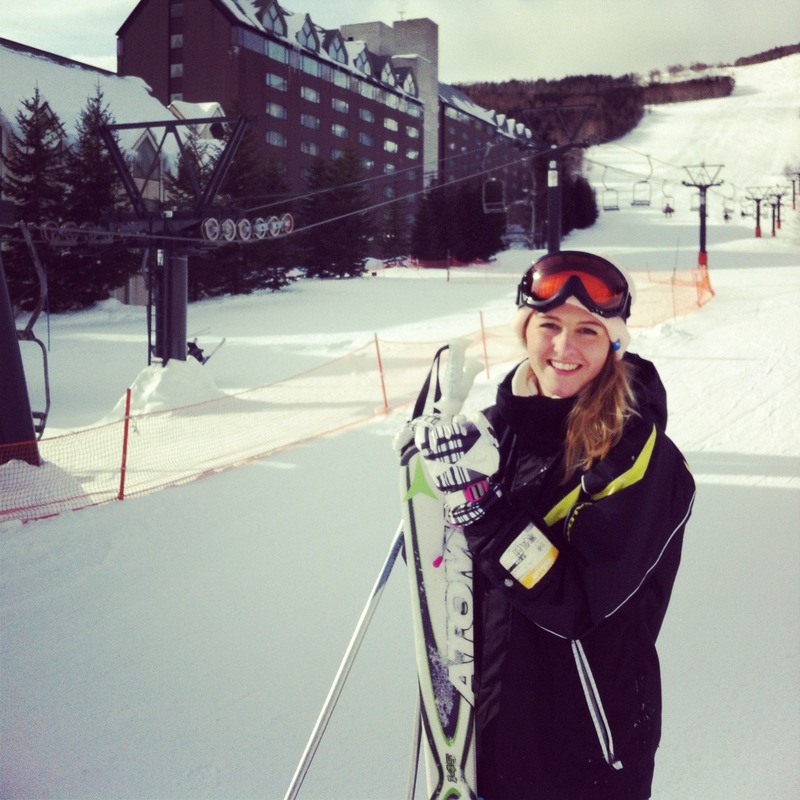 It was great to get back on the slopes, and the scenery was truly breathtaking. We also ate our weight in unbelievable seafood. The sushi was probably the best I’ve ever tasted, and I even worked up the courage to try an oyster for the first time, albeit a cooked one, and actually enjoyed it! 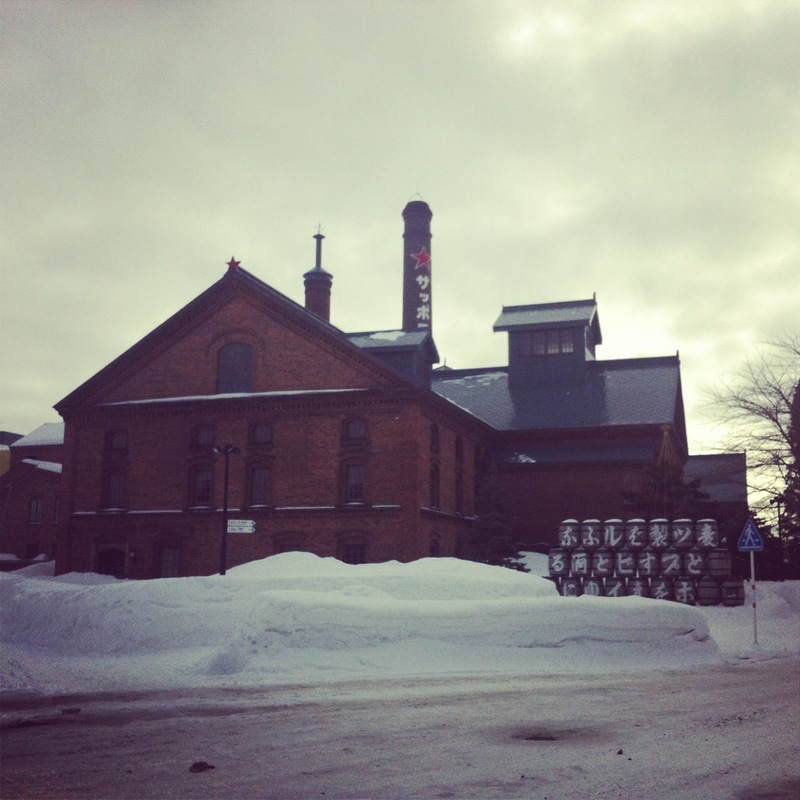 On our final day we had a few hours to spare in the morning, so we decided to squeeze in a last-minute trip to the Sapporo brewery. Once we’d finished walking around, and spending a small fortune in the souvenir shop, we decided to do some beer tasting, even if it was only half past ten in the morning. When in Rome, and all that! They had sets of three different beer to try for a really reasonable price, so we each went with one of those. The beers were all great, although Aliya and I decided our favourite was still the Classic. When we were nearing the end of our third glass, we noticed lots of other Japanese tourists had had the same idea as us and gone for the beer sets. However, everyone else was sharing their’s between three or four people! We obviously didn’t get the memo, and they probably all thought we were crazy, but never mind! My first two weeks of February were spent working full time as an intern at the OICD. This internship is a perfect example of the kind of opportunities that studying abroad can provide – opportunities you would never have expected, but would have completely missed out on had you chosen not to come. If you’re interested in finding out a bit more about what I’ve been doing with the OICD, here’s a link to a blog entry I wrote for them! The last two weeks have been completely crazy, as not only did Charlene come to visit, I had to move out of my room ready to move into a new one when I get back to Japan at the end of March. I’m not entirely sure how I’ve managed to accumulate so many belongings since arriving in Japan, but packing them all up took forever! I brought as much as I could fit in my suitcase home with me, and will be leaving it here (souvenirs, winter clothes etc – let’s hope the weather’s nice when I get back! ), but of course there’s still a load of stuff I’ve had to leave in Japan. Luckily, Aliya and Cafa both agreed to let me take up some of their space for a few weeks, with a few bags and boxes each! I’m really looking forward to moving into the city when I return – it’s going to be so much more convenient, both for studying and exploring! Charlene arrived on Sunday evening (although her luggage didn’t make it until Tuesday! 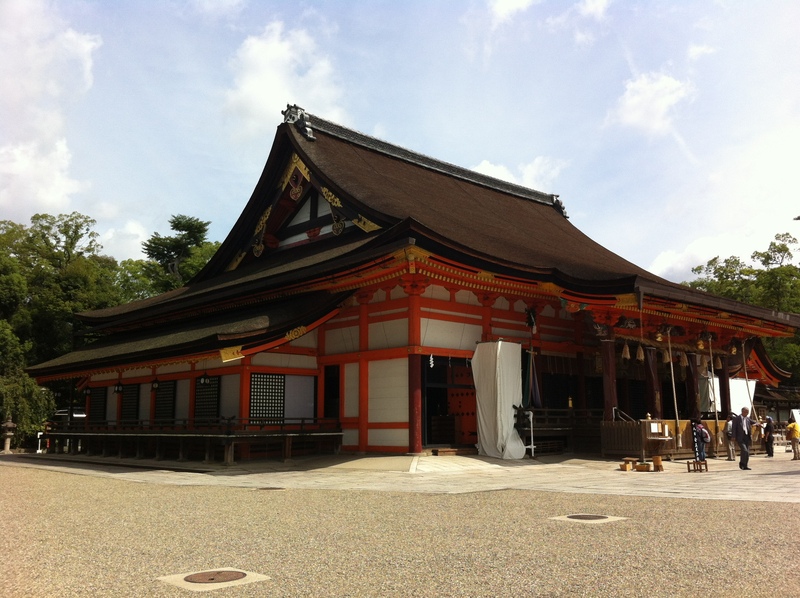 ), and we spent the first four days sightseeing around Kyoto. 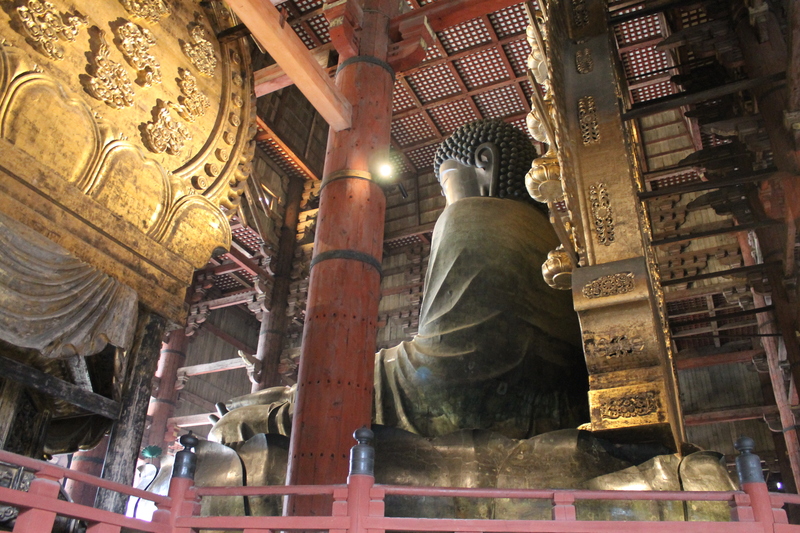 We also went to Nara, Japan’s first permanent capital, to see the Daibutsu (Great Buddha) and, of course, the deer. 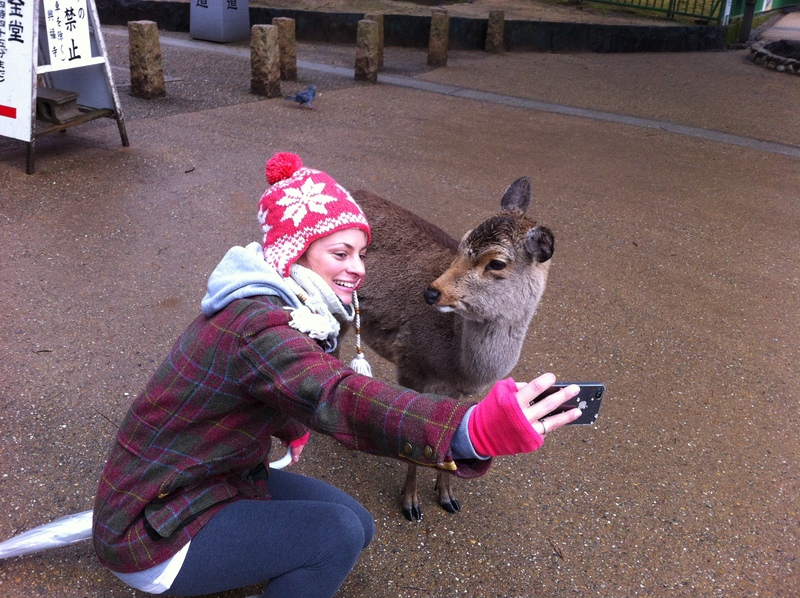 Nara is full of deer, who roam freely around the town, pestering tourists for food. 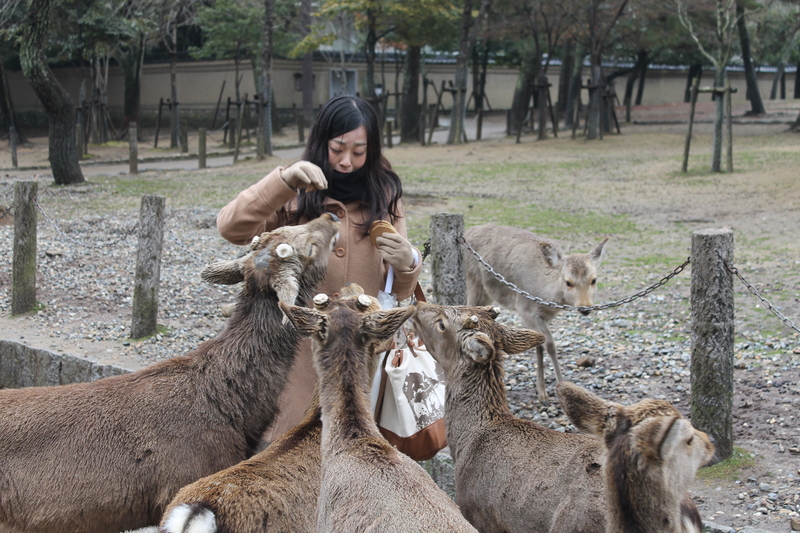 Although you’re able to purchase shika senbei (deer biscuits) to feed them with, they’re not fussy. They tried very hard to get hold of Charlene’s ice cream, and we saw one of them devour a Korean couple’s tourist map, much to their dismay. 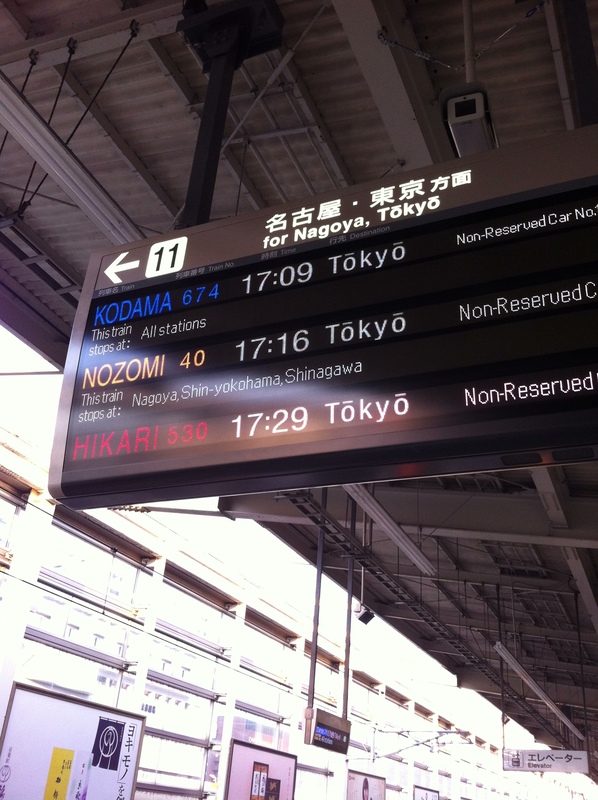 On the Thursday, it was time to move out of my room, and head to Tokyo on the bullet train – one of those Japan bucket list moments. It was all very exciting, although unfortunately we couldn’t take the fastest train, as Charlene had a rail pass which was only valid for the slower ones (although they’re still pretty quick!). We’d booked to stay in a hostel, which turned out to be probably one of the best I’ve ever stayed in (and I’ve stayed in many!). It wasn’t the cheapest – this is Japan after all – but value for money-wise, you really couldn’t have asked for anything better. 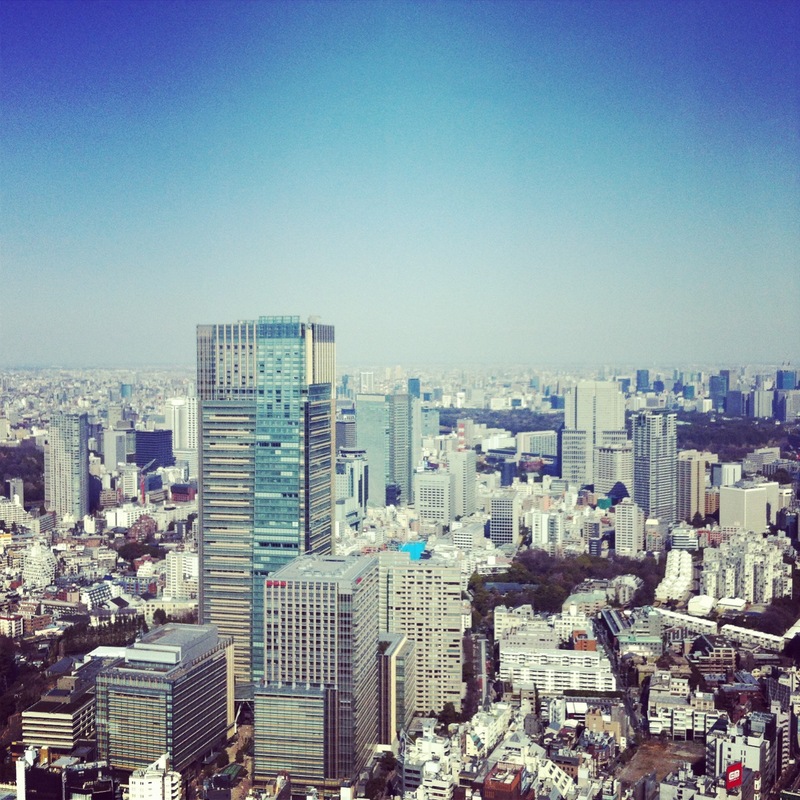 If anyone’s going to Tokyo, I really would recommend it! Great service, friendly staff and delicious food. Check it out here. 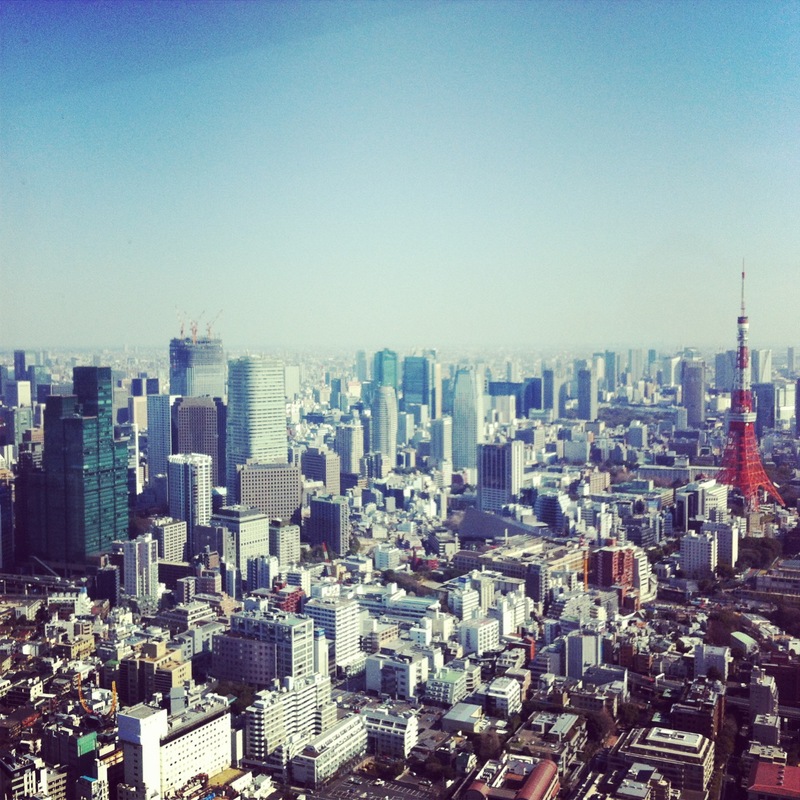 We did all the tourist rounds in Tokyo, the highlights of which, for me at least, had to be the view from Roppongi Hills Mori Tower, ordering at a dim sum restaurant via an ipad, and eating the best Tonkatsu of my life (think Wagamama, but with pork and about a million times tastier). Every restaurant should have these! We also managed to squeeze in a couple of day trips, including to Mt. 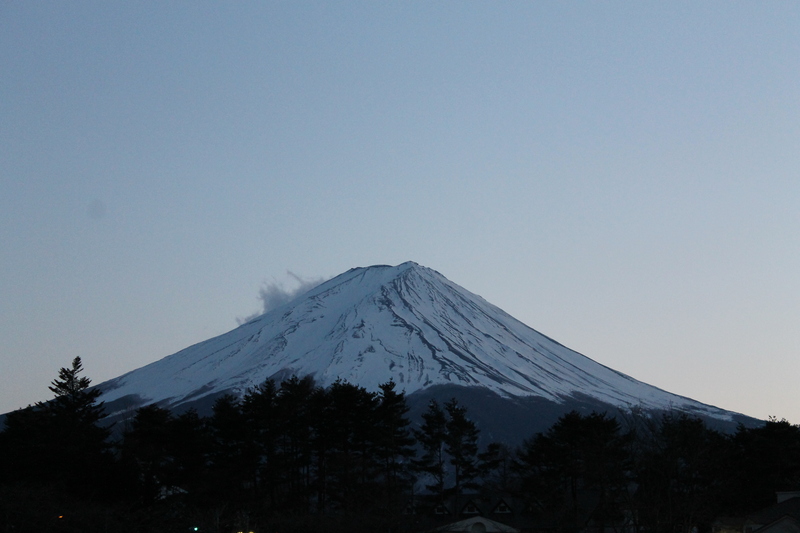 Fuji, which was incredible. We went completely Hello Kitty crazy, and bought so many souvenirs that I’m surprised they let us get back on the plane! But they did (thankfully), so I’m now sat at home in Bournemouth, ready to enjoy the last few weeks of the holidays. It feels great to be back, and to catch up with everyone – I think it’s going to be hard to go back to Japan again this time! Anyway, this entry is huge, so I’ll leave it there. See you all in a few weeks! Firstly, I owe you all a huge apology for my lack of posts over the last couple of months! Very poor effort on my part – wont let it happen again! Secondly, as this is my first post of 2013, I suppose I should say a very happy new year & I hope this year is treating you well so far! December and January were pretty busy, with lots of deadlines, so the last couple of weeks haven’t been particularly fun. 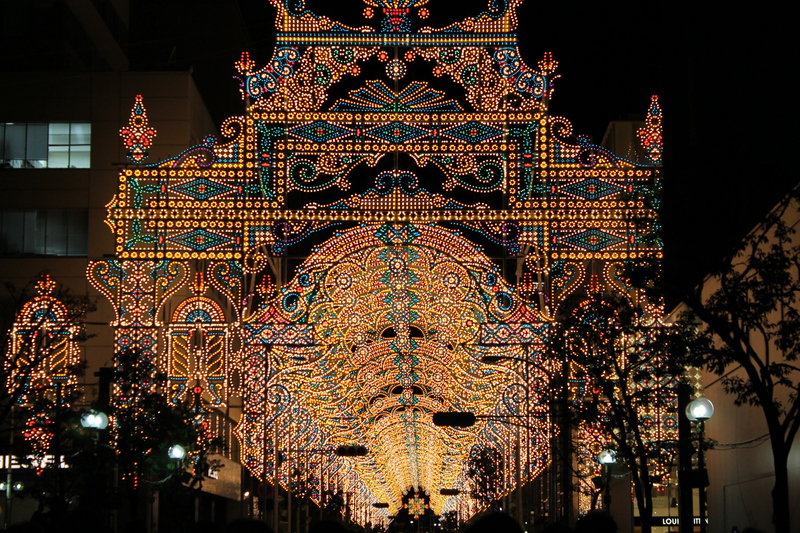 The lead up to Christmas was lovely, however, the highlights being a trip to Kobe for Luminarie, an incredible illumination marking the anniversary of the Kobe earthquake, and a temple light-up at Arashiyama. 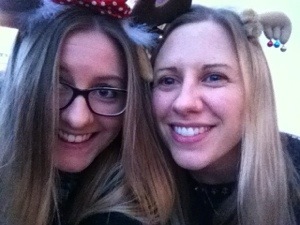 My Cousin & I with our Christmas Antlers! 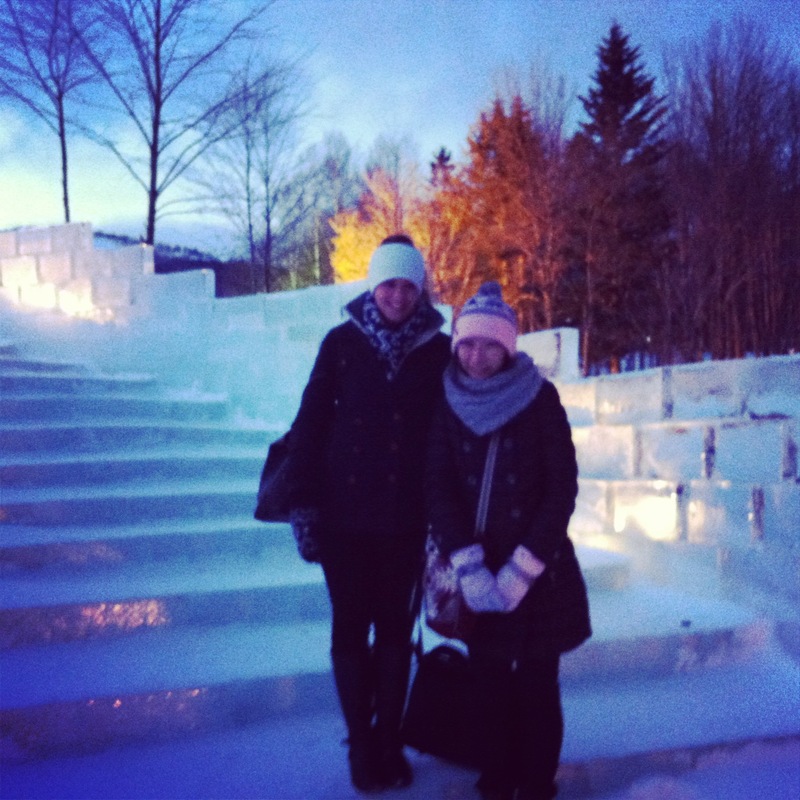 Next week, Aliya, Kanat and I are off to Sapporo (which, for those who don’t know, is on the northern island of Hokkaido) for a three day trip – one which was conceived, planned and booked in under four hours, and probably the most spontaneous thing I’ve ever been a part of! Currently, according to my phone, it’s -6 degrees C there today – slightly worried for my toes and fingers, and pleased I brought so many hats and gloves and jumpers back from home with me. Now that my lectures are coming to an end I’m getting ridiculously excited – will update you with all the pictures once we return! I’m also looking forward to February, when I friend of mine is coming to Japan for two weeks – I’m currently planning loads of exciting things for us to do, including a trip to Mount Fuji and a few days in Tokyo! Can’t wait. I’m nearly half way through my year, which is slightly scary, and more determined than ever to make the most of my time here, so you can look forward to reading about lots of adventures in the coming months! Keep an eye out next weekend for the pictures from Sapporo! 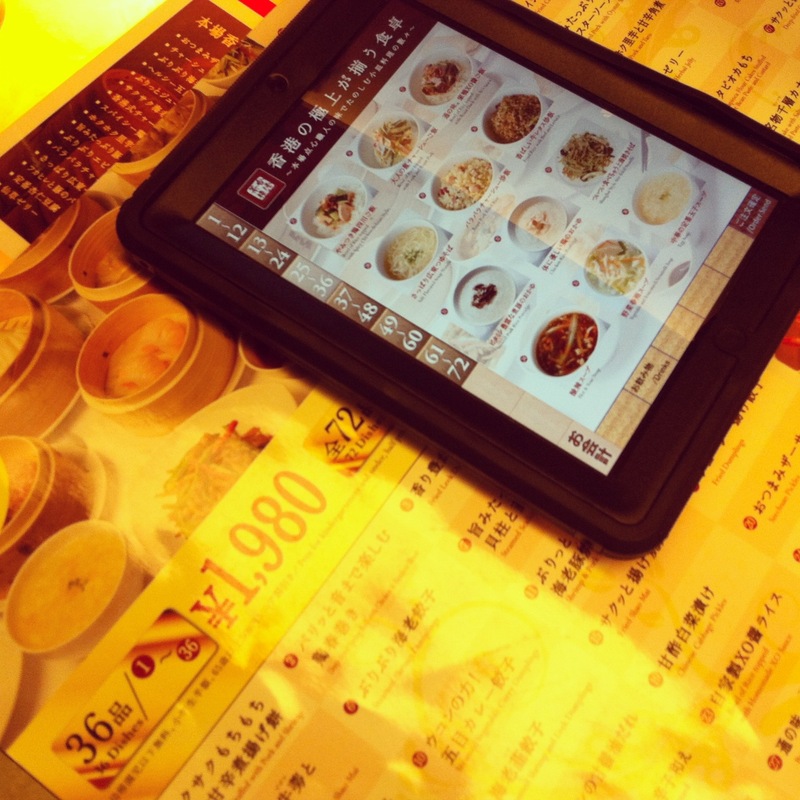 We had a University holiday recently and, as the blog title suggests, I spent my vacation in Hong Kong. I took the opportunity to visit a good friend (and fellow Southamptoner) Michael, who’s studying at the University of Hong Kong this semester, and have a bit of a break before deadline season sets in. It wasn’t my first time to visit – Hong Kong was not only the first place I visited in Asia, but also the first place I visited outside of Europe, and the first time I ever took a long haul flight. Luckily, the flight this time around was far shorter – a mere four hours from Kansai International, although the cheap rates did mean I arrived and left in the middle of the night. It really is crazy to think how much travelling I’ve done, and how much I’ve learnt, since that first trip three years ago. Unfortunately the weather wasn’t great – Michael said the day after I arrived was the second time it had rained since he’d arrived in September. But, being British, we didn’t let it stop us (for the most part, at least) and managed to get a fair bit of sightseeing in despite the drizzle. It was nice to do some of the things I didn’t manage to fit in last time, like Hong Kong Park and the Avenue of Stars (most of whom I had never heard of – it’s the Asian version of the Hollywood Walk of Fame, highlights including Jackie Chan and Bruce Lee), and experience the campus at HKU, which couldn’t be more different from Doshisha. It’s like a 3D maze – I struggle to understand how anyone finds their way around, and can just imagine myself getting hopelessly lost and being late for every class. Highlights of the trip definitely include a trip to the Michelin-Starred Dim Sum restaurant (hailed as the cheapest in the world), Tim Ho Wan. A little difficult to find, and there’s no signs in English, but the crowds outside give it away. I highly recommend the pork buns, which are simply divine, but get there early – we had around an hours wait and it wasn’t that busy. Michelin Star Dim Sum? Don’t mind if we do! Going back to Hong Kong reminded me of why my love affair with Asia began in the first place – it really is a fantastic city: incredible sights, delicious food and outrageous nightlife – and I was almost sad to come back to Japan, knowing that my busy schedule of classes and a tonne of assignments awaited me. But that’s the wonderful thing about studying abroad – when you return from vacation, you’re returning to a place which is equally as exciting and unique in it’s own way. I’ve returned to Japan with a renewed vigour to truly make the most out of my time here, and discover things about Kyoto that I love just as much as Hong Kong. First, an apology. I have been severely neglecting my blogging duties for the last few weeks. On the plus side, this means I have a lot to tell you, you lucky people! I’ll start where I left off, shall I? 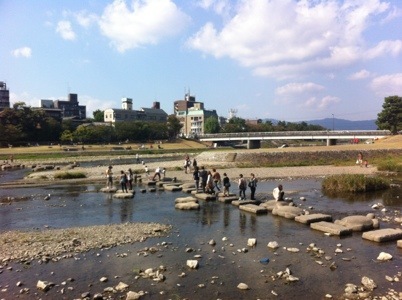 The day after I wrote the previous entry, I went for a picnic with some of my Japanese friends in the city. The weather was still lovely – it’s getting colder by the day now! 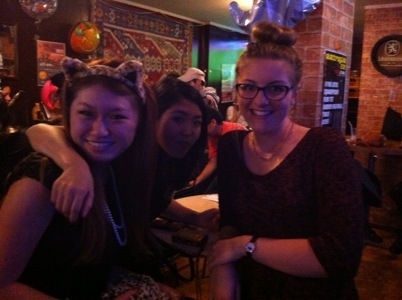 Then came Halloween. That afternoon, the topic of my Intro to Japanese Culture lecture was origami. Probably the most fun I’ve ever had in a lecture! 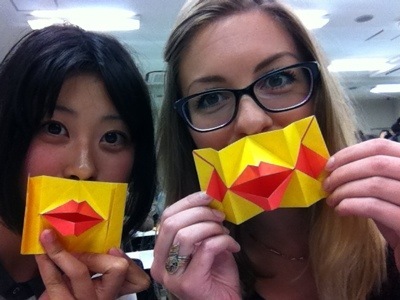 Here’s some pictures of our lovely lecturer, Professor Foreman-Takano, showing us how to make ‘Kissing Lips’. We were pretty impressed with the finished product if, if I do say so myself! That evening I ventured out into the city for a few drinks with some friends. I was seriously lacking a costume, (poor effort, I know) and felt very bad about it, especially when the girls on the table next to us kept disappearing into the bathroom looking normal and coming out covered in blood, cobwebs and various other Halloween attire. Must do better next year. The following day, I had my first meeting with the Organization for Intra-Cultural Development, an NGO directed by one of my lecturers here at Doshisha, at which I recently became a volunteer. 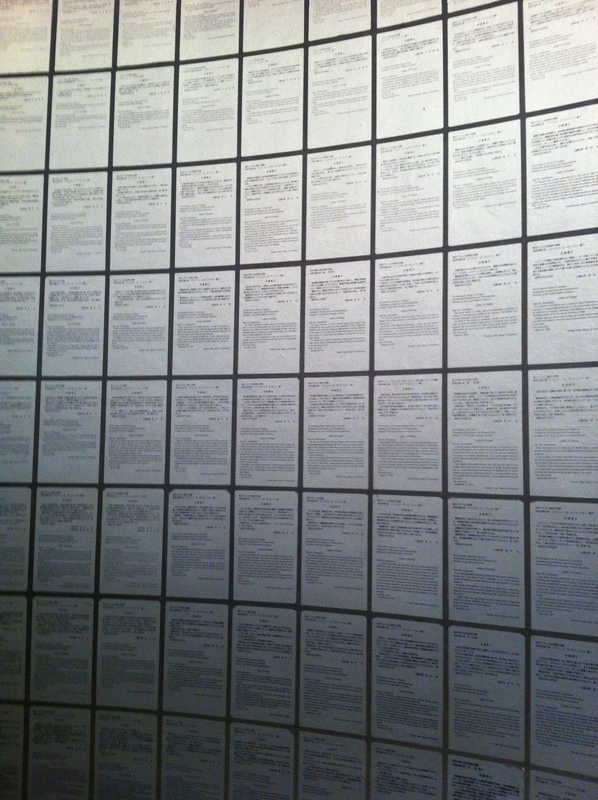 I also found a flyer for a yoga class, taught in English, which takes place in an art gallery. I’ve wanted to start yoga for ages now, so I was probably a bit over-excited about it, but so far I haven’t been disappointed! I went to my second session yesterday, so my muscles are a little bit cranky to say the least, but Sandra is a great teacher and the atmosphere is so wonderful. I can see myself getting addicted to it pretty quickly! 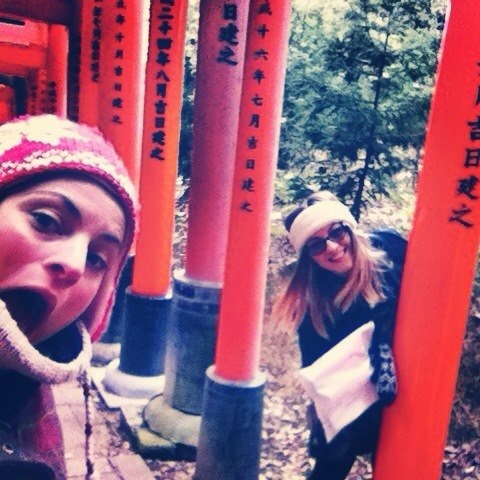 Last Saturday I went on an impromptu day trip to Fushimi Inari with Aliya, an intern at the OICD, and some of her friends. 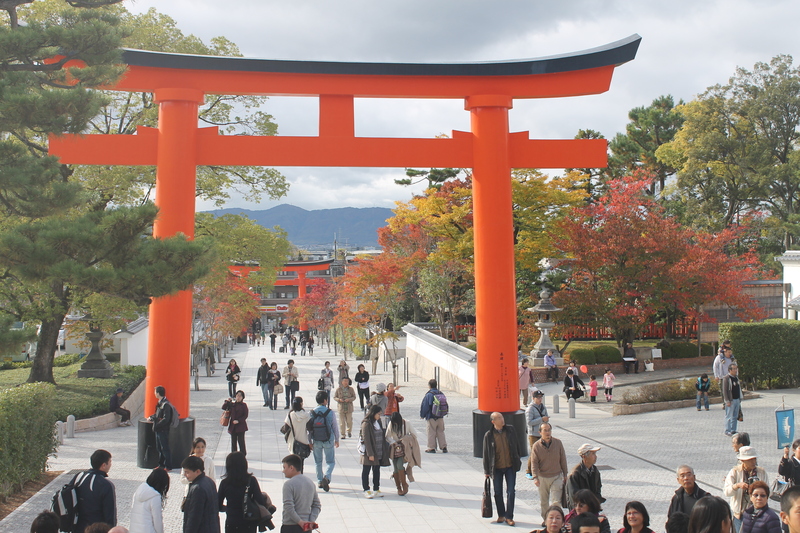 Fushimi Inari is a Shinto shrine, famous for the trails which lead up Mount Inari, and are covered by hundreds of bright orange torii gates. It was really beautiful, even if it did involve a little too many stairs for my liking. The best thing about it was it was so peaceful – you really felt like you were in the middle of nowhere, when in reality it’s only a five minute train ride from Kyoto station. 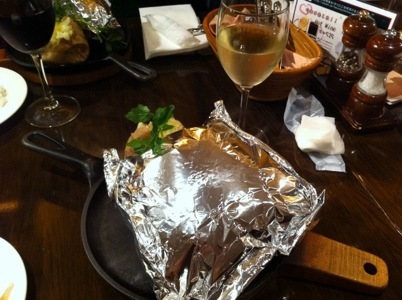 After we’d worked up an appetite, we went and had a delicious dinner – steak, which came in a foil bag. Pretty novel! And I think that brings us pretty much up to date! 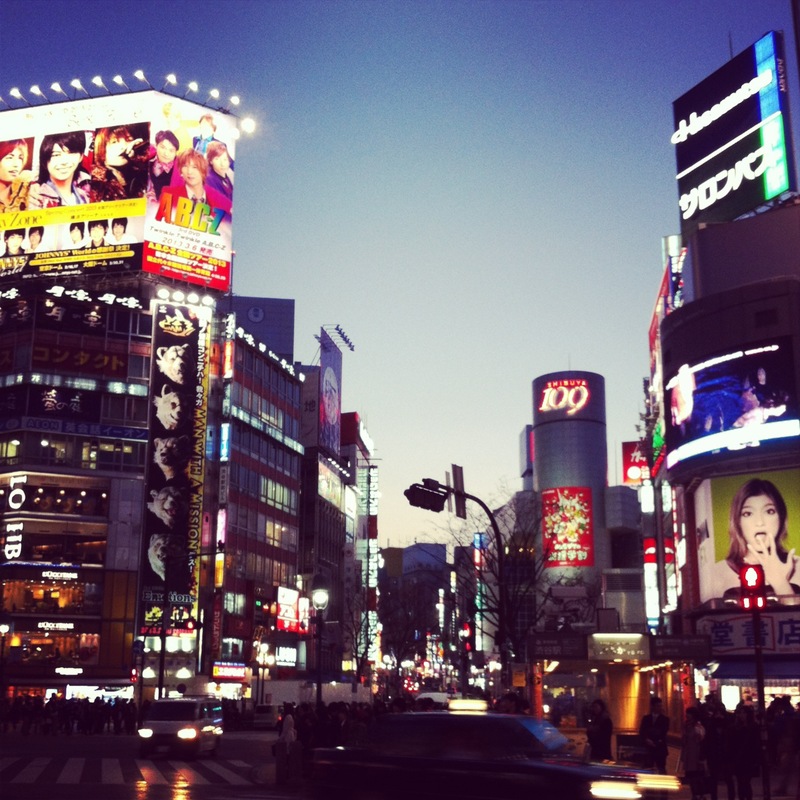 Last night I went to Osaka to try and sort out my phone (it’s only taken me nearly two months! ), but I’ll leave that for another blog! I fully intended on writing this yesterday, exactly one month after my arrival, but some impromptu Friday night plans got in the way, so you’ll have to read it a day late. One month in and everything is still going smoothly. 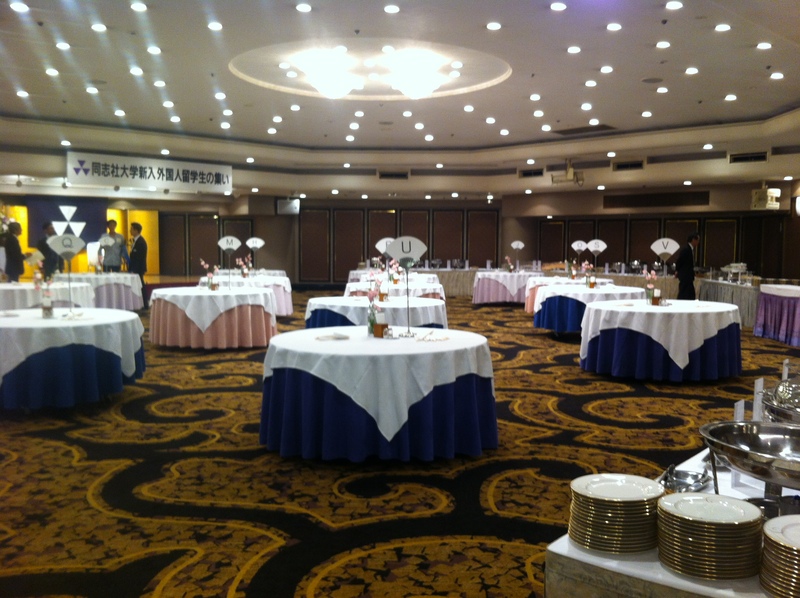 Last Thursday, Doshisha held a welcome party for all the new international students at the Kyoto Tower Hotel. Most of the speeches were made in Japanese, so I had no idea what was going on half the time, but the buffet was amazing. Andrea and I had our fill of sushi, although he wasn’t impressed with the pasta, and promised he’d cook some proper Italian food for me another day! I also made the exciting discovery that my Filipino friend, Cafa, from my Japanese class actually lives in the room next door to mine. 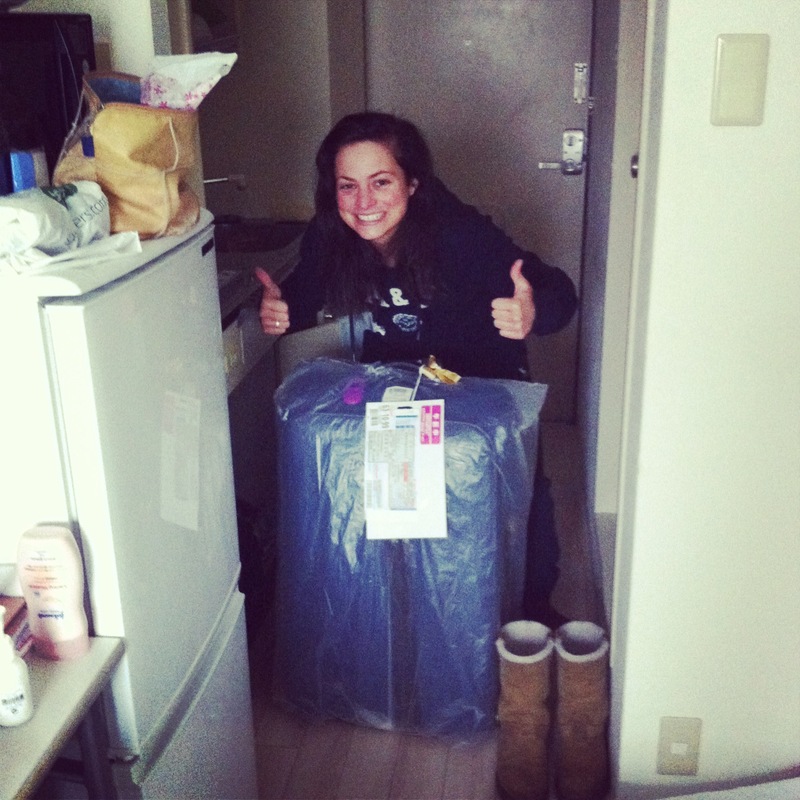 We had fun comparing rooms when we got home – pretty jealous that her wardrobe is about 3 times bigger than mine! 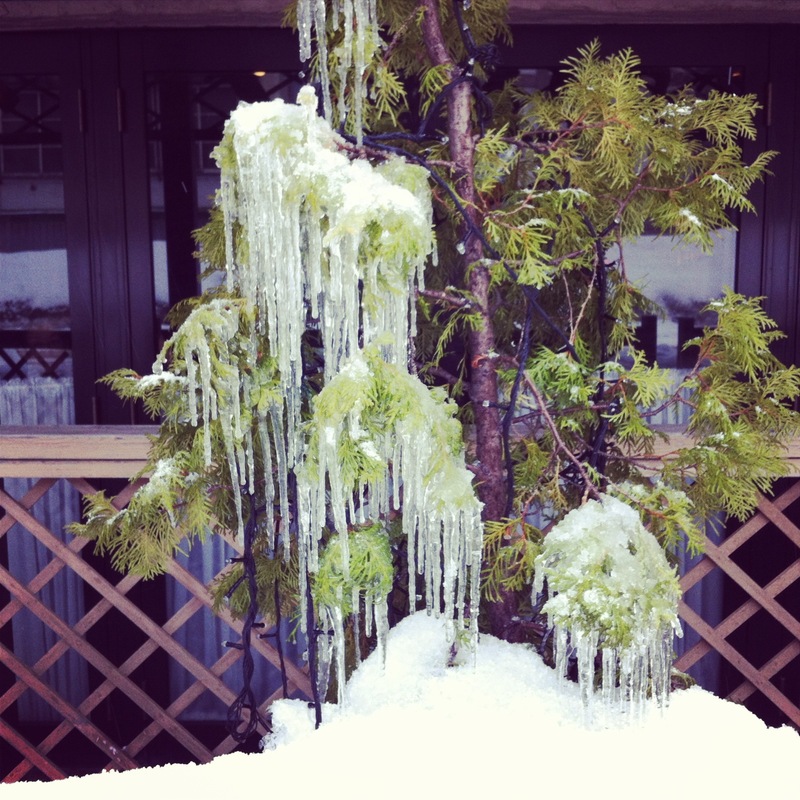 The weather’s been increasingly unpredictable, and this week brought heavy rain and cold winds. I thought I could manage without an umbrella, but after getting saturated on the way to uni, I bit the bullet and went straight to the convenience store to buy one. Needless to say, it’s already come in useful. On Thursday, I went for breakfast with Richard Emery and Professor Nutbeam, the Vice Chancellor of Southampton, at their hotel. Another great buffet, accompanied by a fantastic view – just a shame about the clouds! 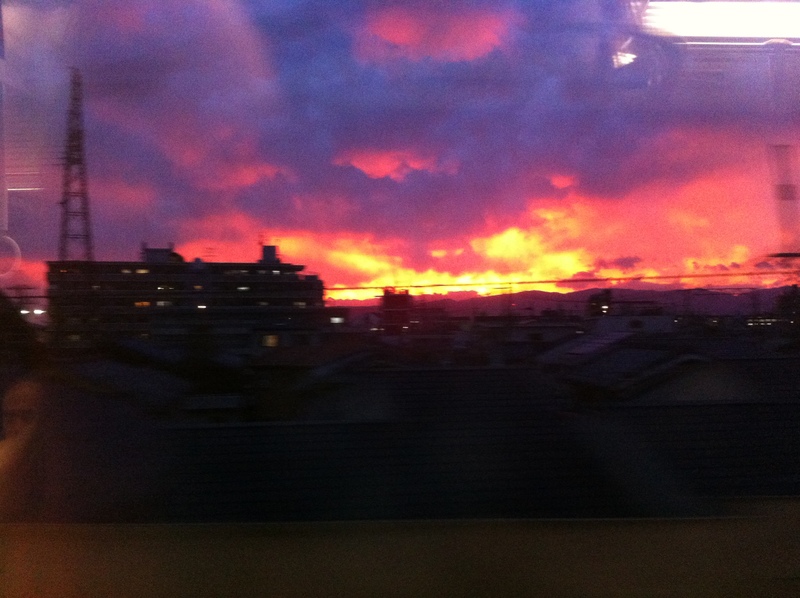 The sunset that evening was spectacular – unfortunately I was on the train and only had my phone with me, so you’ll have to forgive me for the appalling pictures. Hopefully you can see what I mean! After Japanese class on Friday, Cafa and I went to grab a bite to eat on campus, where we bumped into two of her Indonesian friends. 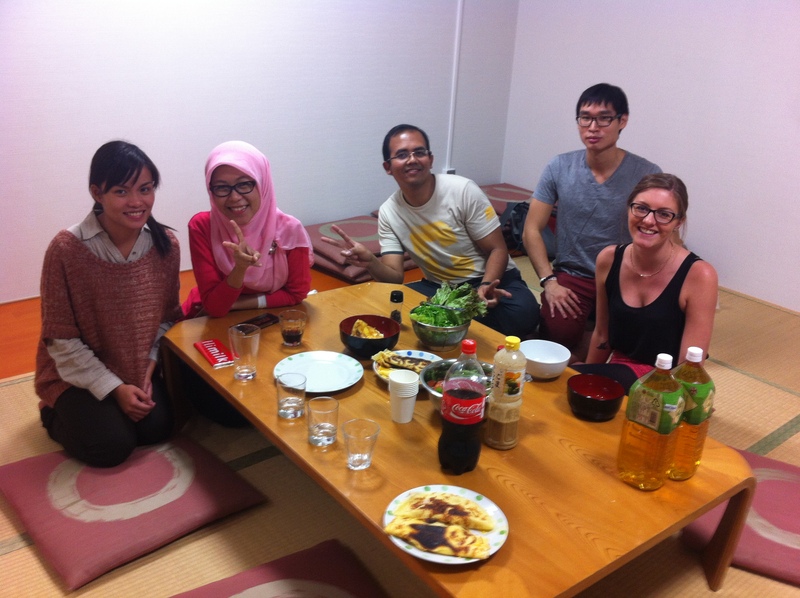 After impressing them with my knowledge of Indonesian food, they invited me with them and Cafa to Tatara Campus, the other halls of residence near to Kyotanabe Campus. One of their French friends was cooking crepes, so Cafa and I proceeded to have dinner number two. I’d never tried a savoury crepe before, but I was very impressed – it definitely won’t be my last one! Tatara Campus used to be a hotel, and the structure has hardly changed, so it has a very bizarre feel to it. 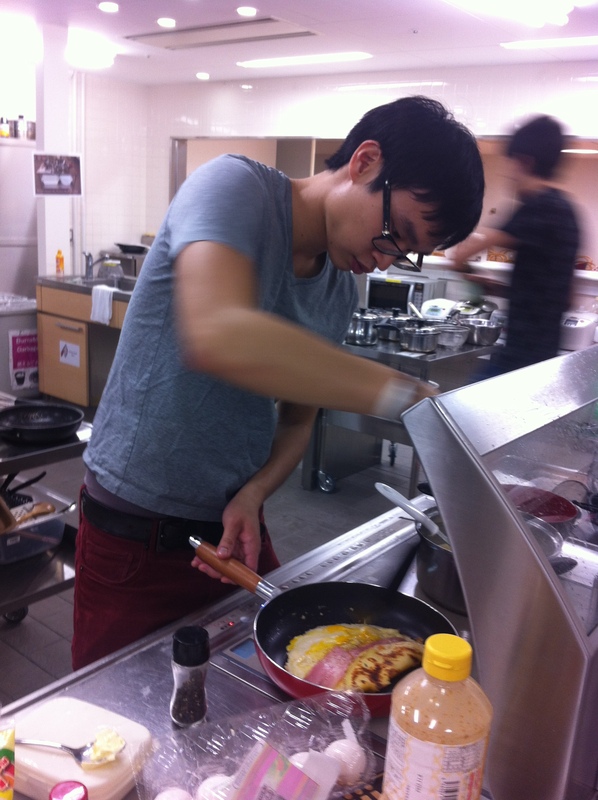 Everyone shares a huge kitchen – it felt like we were on Masterchef! It was a fantastic evening, and lovely to meet some new people. Now I’ll just have to think of something I can cook from the UK! Thanks for the delicious food guys! I’m nearly half way through my third week at Doshisha already. I can’t believe how quickly the time is going by, and I’m increasingly conscious that the excuse ‘I’m new here!’ is not going to pass for very much longer! That being said, last week saw me actually finding and borrowing books from the library, picking up parcels (of utensils – thanks Mum!) from the post office and paying next month’s rent all by myself! 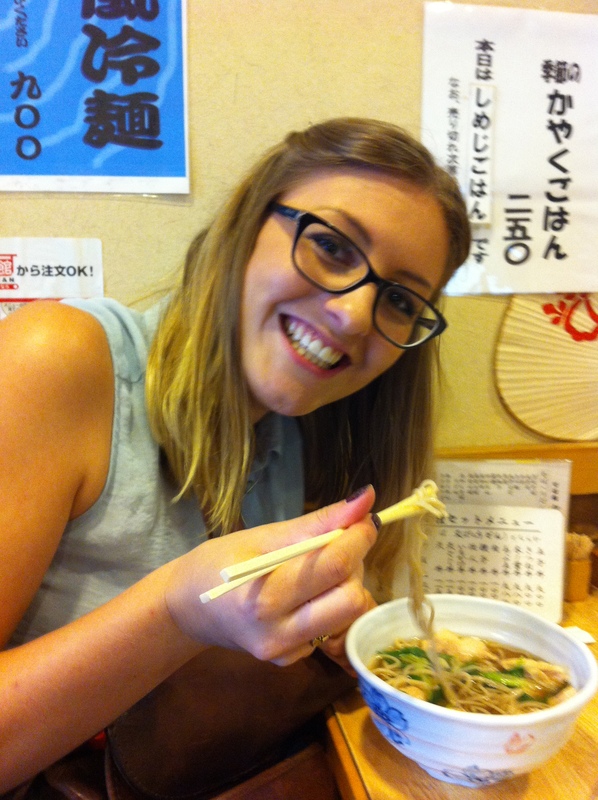 My Japanese is slowly improving (emphasis on the slow) – I managed to have a few successful basic conversations with people over the weekend, so there’s still hope for me yet! On Saturday, I went for coffee with Southampton’s Pro Vice-Chancellor International, Professor Mark Spearing, and Richard Emery from the International Office. It’s always great to see people with a connection to back home, and we had some really interesting conversations regarding the reasons why more British students don’t study abroad. 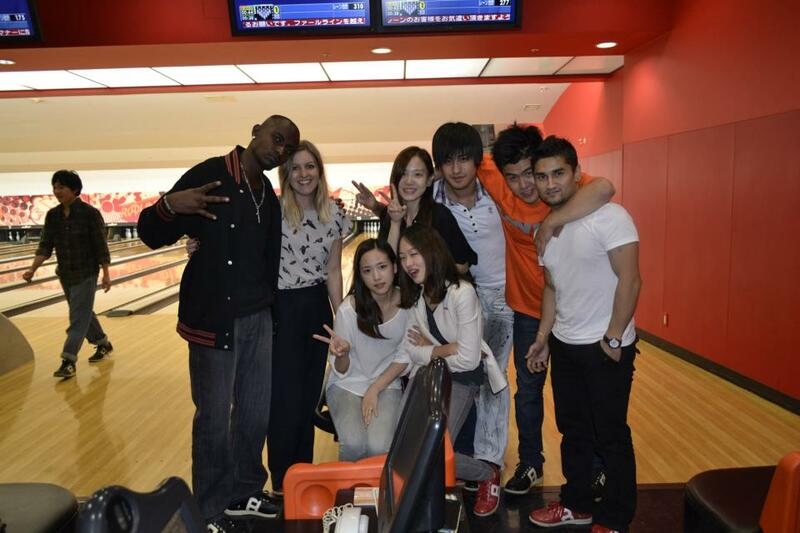 The weekend also brought with it my first real social occasion of the year, with one of my new friends’ birthday party. 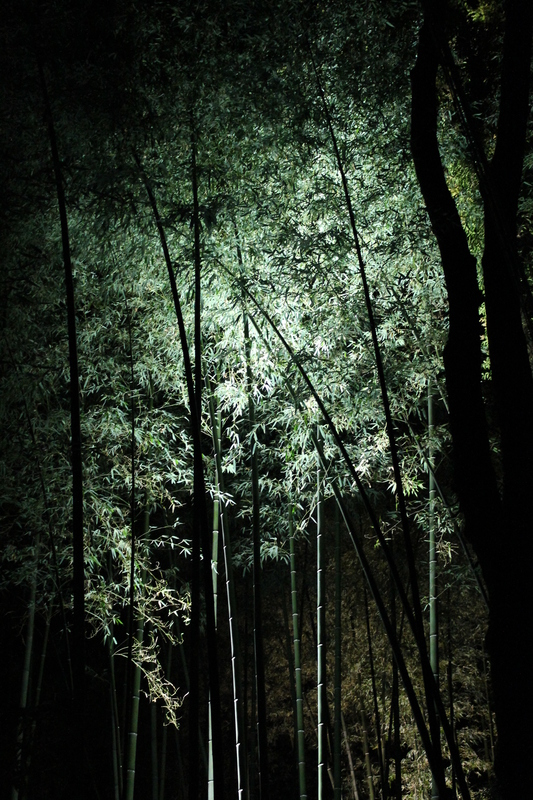 It was great to see some more of the city and experience the Kyoto night life. One of the highlights was stopping off for a game of bowling at midnight, which Sanjol and I managed to win (definitely thanks to Sanjol’s bowling skills, not mine). Richard told us that he felt Japan was the kind of place that really grows on you, and I can honestly say that I agree. I’ve only been here for three weeks and already I feel so at home. I can only hope it continues to get better! As the rather dramatic title would suggest, I have indeed survived my first week of lectures at Doshisha! If Facebook is anything to go by, my ‘freshers week’ hasn’t quite been as outrageous as some of yours (a status about one of my old housemates asking the bus driver for a double instead of a return was my particular favourite), but it really has been like starting university all over again – not knowing my way around campus, making new friends and learning how to use the library. 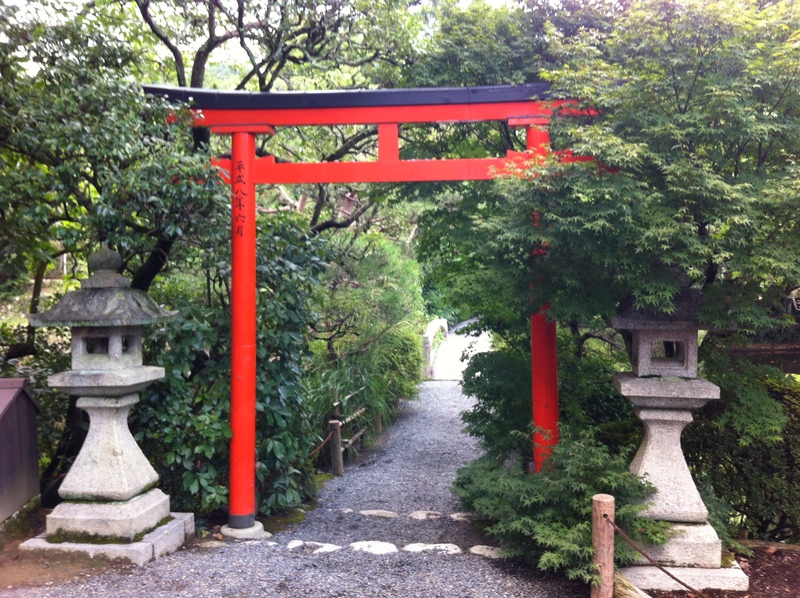 On Monday morning I headed into the city to meet Jenny and Ian for their final morning in Kyoto. 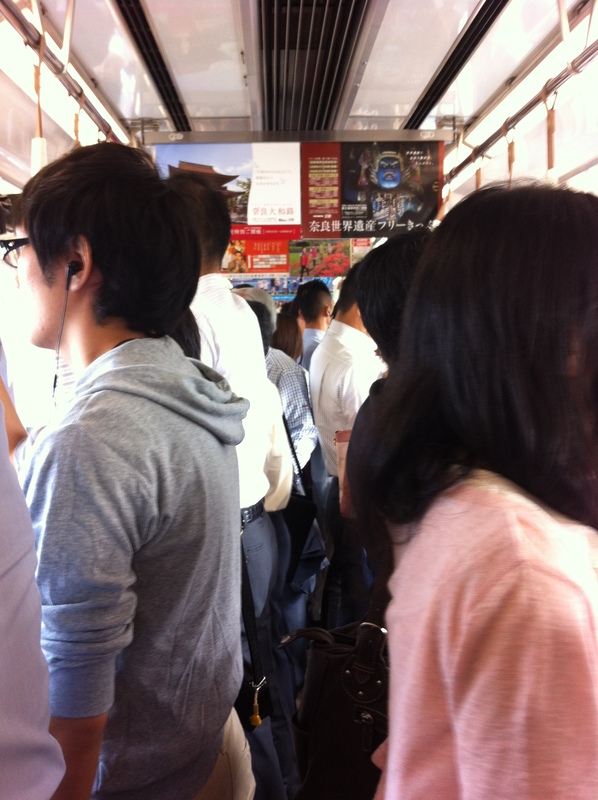 Unfortunately I hit rush hour, so was travelling alongside all of the commuters. The Japanese seem to have perfected their sleeping on trains technique – I even saw one lady fall asleep standing up. How they don’t all miss their stops is beyond me! We spent the morning wandering around the shops and trying not to spend all of our money (everything here is so adorable!). I had to keep reminding myself that I’m not a tourist, and that buying innumerable phone charms and Hello Kitty merchandise is completely unacceptable, although I may have to go back for the panda chopsticks at some point. 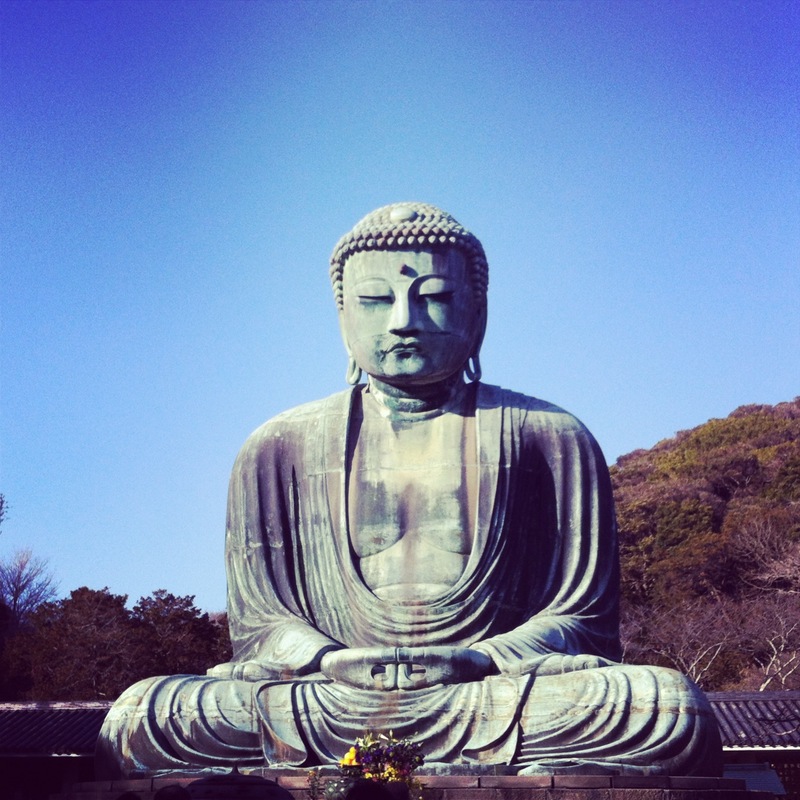 After discovering yet more beautiful shrines and temples, it was time to head to Imadegawa campus for my first lectures. I managed to find the right room, only to discover that my first two lectures (taken by the same Professor) were cancelled. As each lecture is an hour and a half, this meant I had nearly three hours to burn before my final lecture of the day – the perfect opportunity to explore the Imperial Park, which is situated right next to the university. Or at least it would have been, if I hadn’t realised about five minutes into my walk that I’d left my purse – containing all my money, cards and room key – in the toilet over an hour earlier – not ideal, especially when you’re an hour away from home! Thankfully, someone had handed it into the International Office, so the disaster was averted, but it was definitely a lesson learnt! (I can just picture my mother rolling her eyes as she reads this!) I figured that was more than enough excitement for one day, so decided to stay put and wait it out on campus. I’ve managed to work out the Doshisha equivalent of Sussed & Blackboard, so am now able to check my emails & download course materials, and I even know how to search for a book in the library (although finding it might be a whole other story – a challenge for next week I’m sure!). I’m getting get to grips with the system here, and am starting to settle in nicely to my new routine. Hopefully tomorrow I’ll get to explore some more of the city, but it looks like we’re in for a couple of rainy days! It’s still 25°C though, so I can’t complain too much! Konbanwa! I’ve just got home from a busy day of sightseeing around Kyoto and thought I’d update you all on the last couple of days. 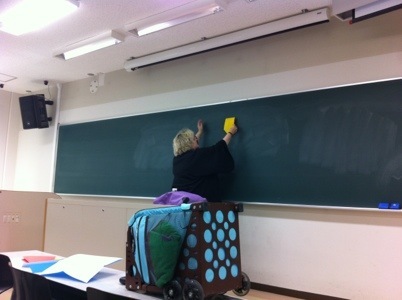 Yesterday I headed up to Kyotanabe campus to select my courses for this semester. There are some really interesting subjects and I had previously thought that it would be a difficult decision as to which ones I could take, until I found out that the number is really only limited by timetable clashes and whether or not you have enough time to get from one campus to the other (which takes around an hour by train). So I’ve ended up with nine courses – two are Japanese language classes, and the rest include subjects such as politics, anthropology and philosophy. If you’re thinking ‘that sounds like a lot’ – so am I! Apparently that’s a normal amount for students here (who’ve clearly worked out a way to squeeze more hours into the day), but it’s over double the number of classes I take at Southampton. I think it’s going to be a busy semester! I have my first lectures tomorrow, so I’ll let you know how they go! Today I woke up early and successfully took the train into the city alone for the first time – very proud of myself – to meet Jenny, a former colleague of mine, and her partner Ian, who are on holiday here at the moment. Even though it was raining, we proceeded to spend the rest of the day being horrendous tourists, taking photos of absolutely everything (I took 138 in total) and getting in everyone’s way. 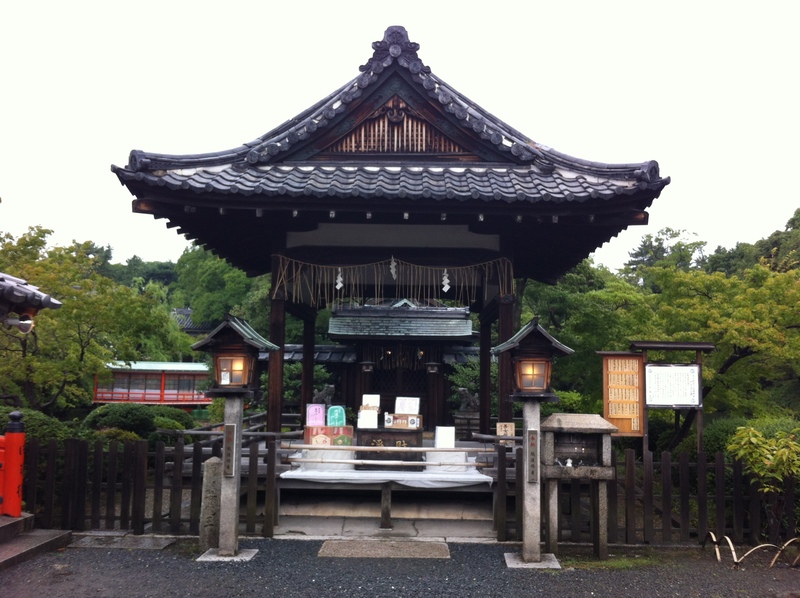 The first stop was what I think was called the Shusse-inari-jinja Shrine – a gorgeous little temple squeezed in amongst the houses. We then walked on to Nijo Castle, which was originally built in 1603 as the official Kyoto residence of the first Tokugawa Shogun. The castle grounds were peaceful and really lovely to walk around, and there was a great view from the top. 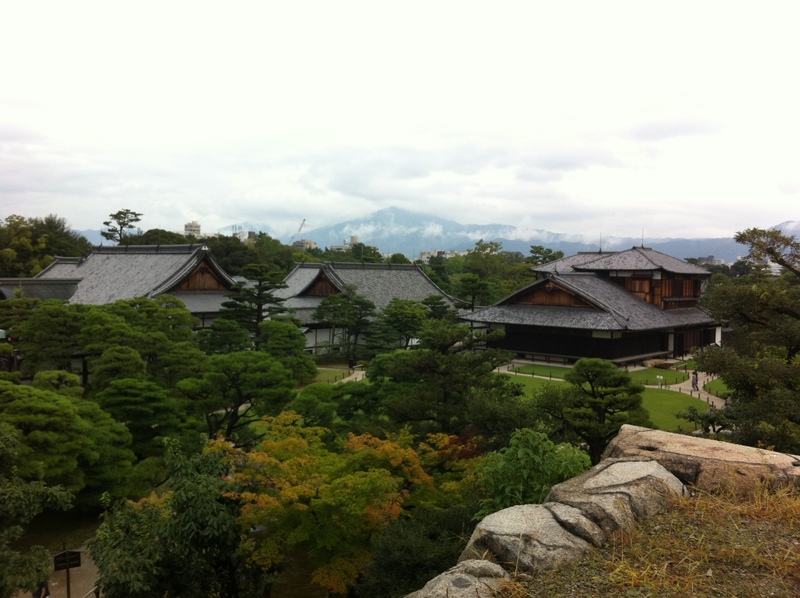 After the castle, we decided to walk to Kinkakuji Temple, or the Golden Pavillion. It was a pretty long walk, and we stopped off for some ramen on the way. Ian showed off his Japanese skills (which are much better than mine!) and helped us order our food, which was delicious. Ian ordering our lunch, with a little help from the pictures in the window! 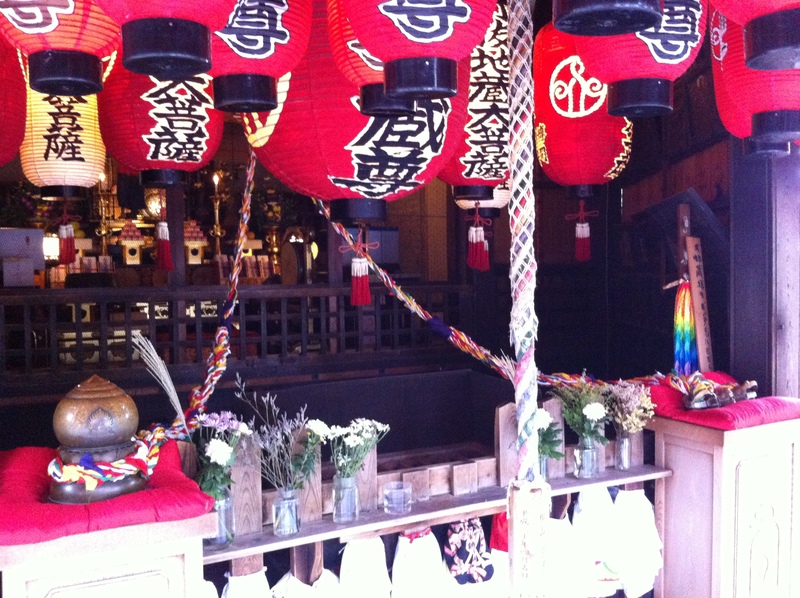 Soon after lunch we stumbled up another temple, again just squeezed in amongst the other buildings. Kyoto is such a mix of modern and traditional, and it’s wonderful to see the two living alongside each other so closely. 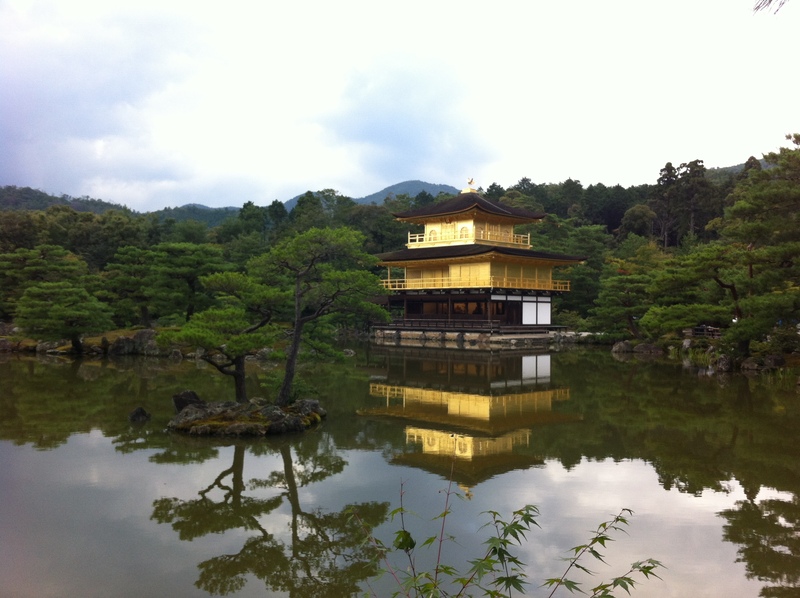 When we eventually reached the Golden Pavillion, we all agreed it had been worth the long walk. Even though it was a cloudy day, the temple was stunning, as were the grounds. 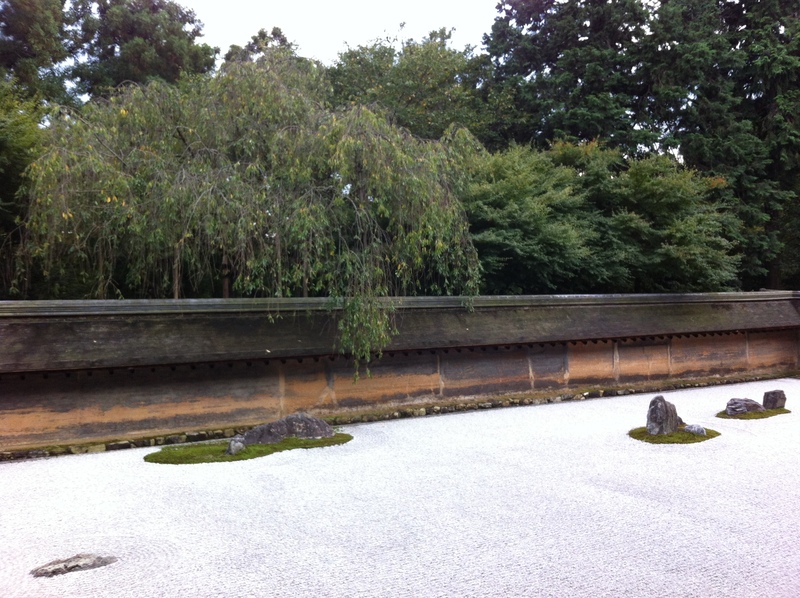 The last official stop of the day was Ryoanji Temple and Zen garden. Luckily we got there just before closing time, enough to sit and contemplate life (and rest our weary legs) in the Rock Garden. We decided to call it a day and walk to the nearest train station, but Kyoto had one more delight it wanted to share with us before we went home. 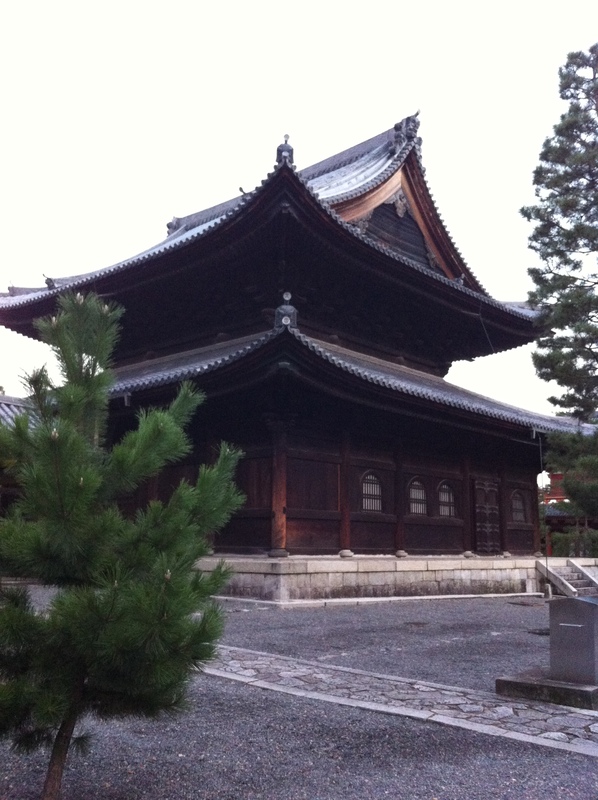 We walked through an entire complex of temples, some of which were absolutely enormous. Unfortunately, it was past closing time, but I’m definitely going to return another day to explore some more!